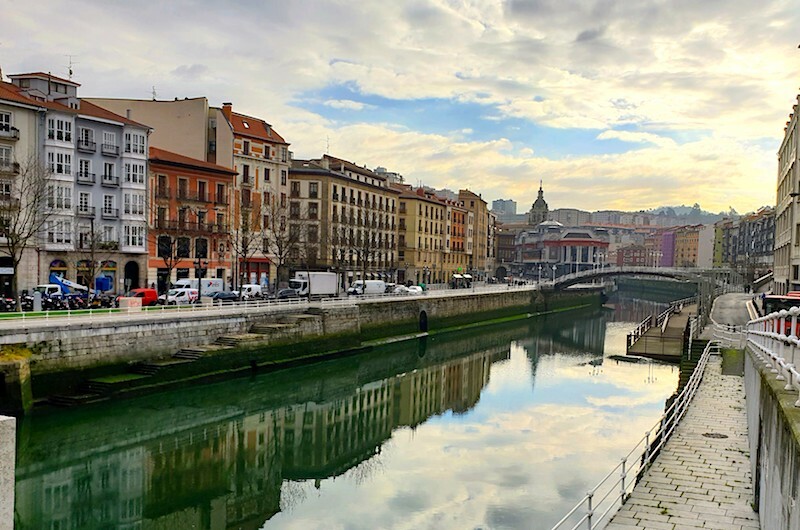 Think of Spain’s Bilbao and what comes to mind? 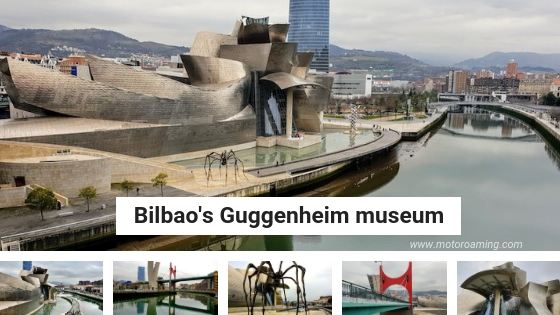 Ferries, industrial port or perhaps the most iconic building – The Guggenheim Museum. 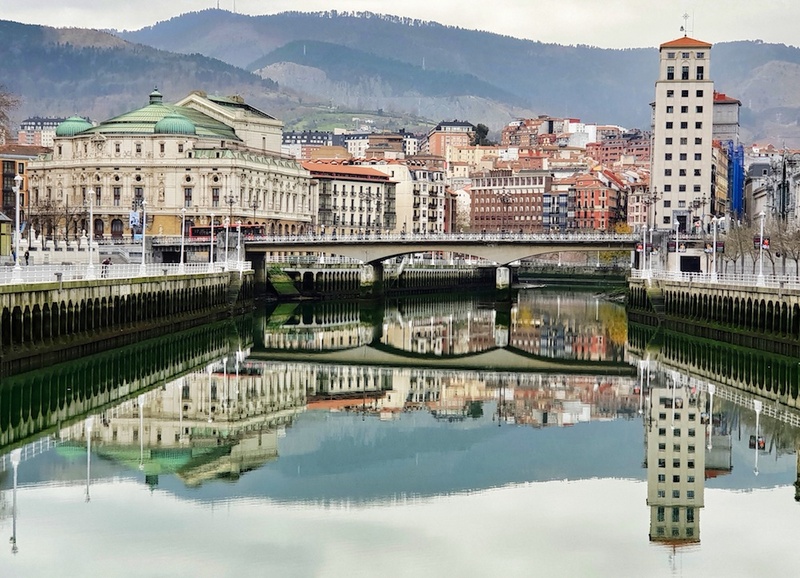 Set on the northern coast of Spain, Bilbao is much like any other city you pass through; enormous, all-consuming and a tad impersonal. Remember that my views are coloured by being a predominant introvert who finds the vibrations of cities easily overwhelm my senses. 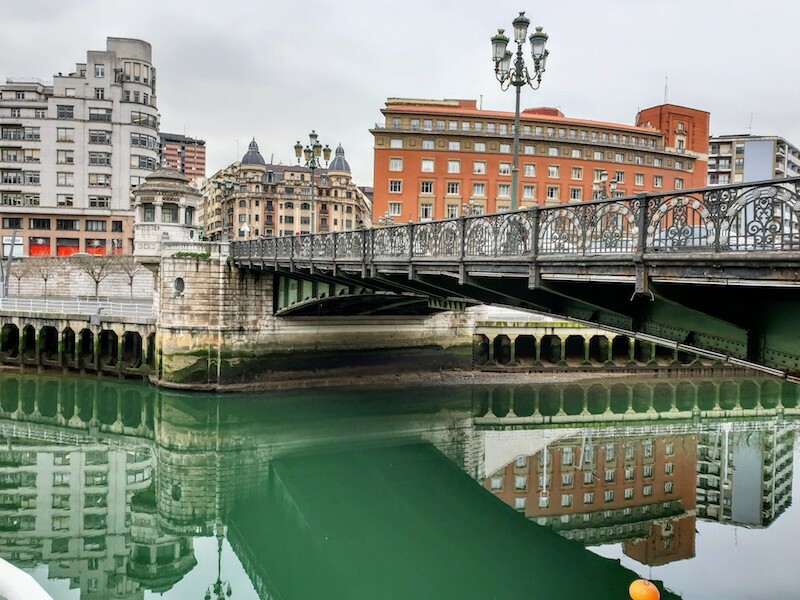 And as we drove inadvertently through the centre of Bilbao’s hub, with congested streets, towering six story buildings rising like vertical umbrellas, I was left with the same detachment that I feel in many of the cities we visit. Had we made a mistake coming here? 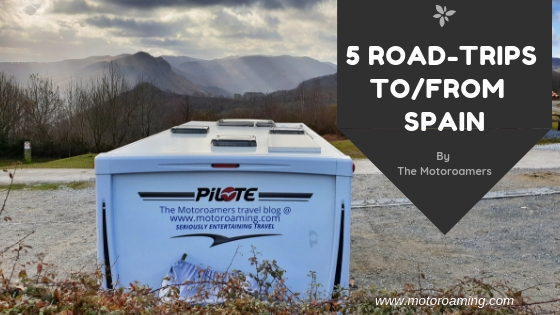 Still we have come to appreciate after three years on the road, that travel is made up of a myriad of experiences. Each one we either love or tolerate and yet all of them are necessary to broaden our cultural horizons. So we valiantly continue to put cities on our agenda; some we end up adoring like Zagreb, Bratislava and Seville and others just don’t really do it for us like Vienna, Salzburg and Florence. You really could be forgiven for thinking that Bilbao is just about the ferry. And yet in the last twenty years, it has taken its rightful place on the tourist map. 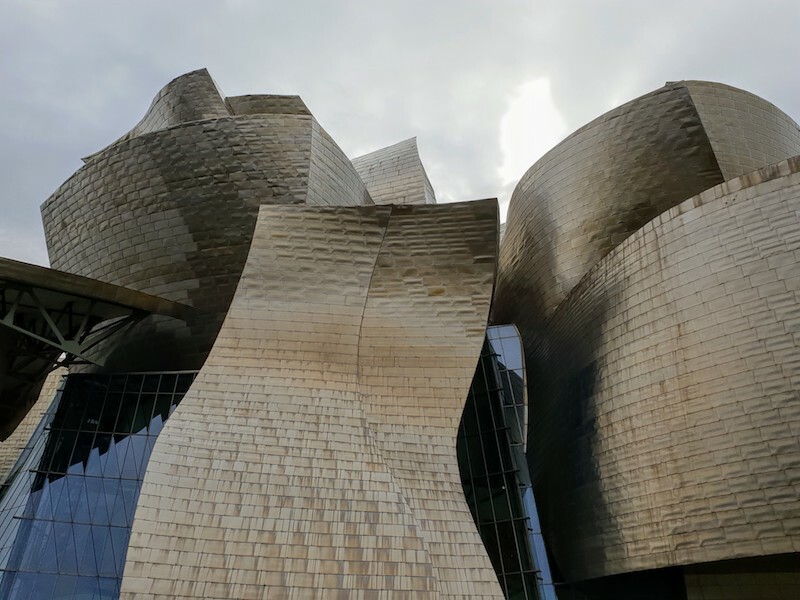 Its most significant draw is the masterpiece of the Guggenheim museum and whether you are an art lover or not, this building is renown around the globe for its architectural brilliance. I’m neither a great artist nor an art fan if I’m honest, although sometimes there are things that are so iconic that visiting is a given. I love that visiting somewhere new can influence how I think and feel or affect my perspective on life. And that’s why a visit to a place as iconic as the Guggenheim felt important. With its curves and light attraction everything about this building attracts the eyes and creates intrigue. Despite the art within being priceless, the building itself makes a statement all of its own. 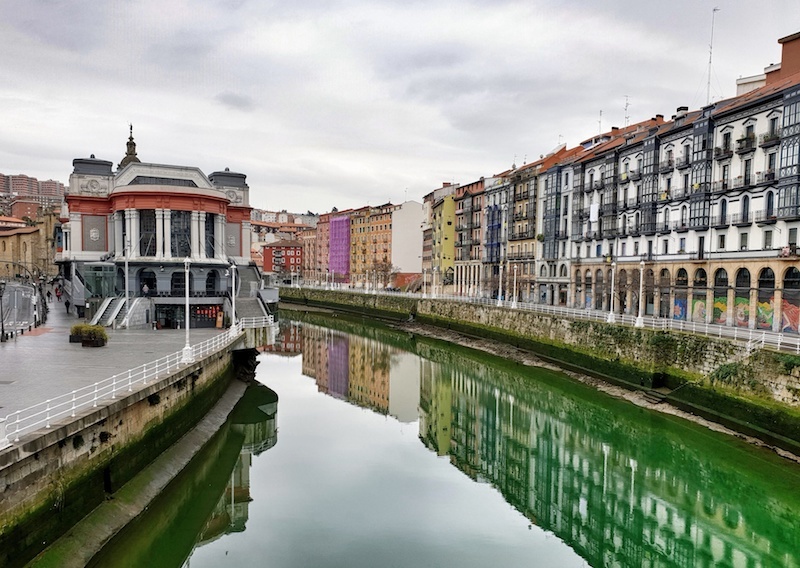 With a tantalising tease of the cityscape from our lofty campsite at Kobeta, we took bus 58, which goes every 15 minutes from right outside the campsite into Bilbao old town. 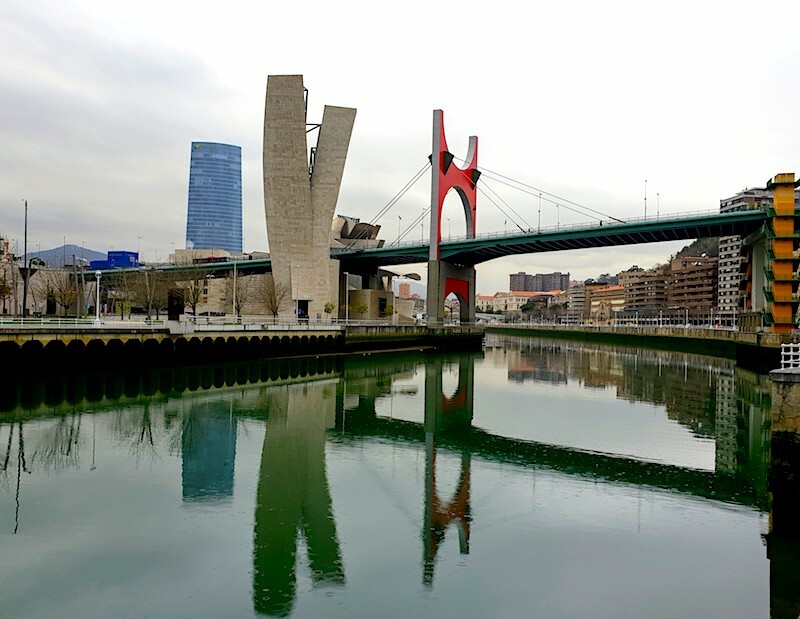 The €1.35 fare was a steal, allowing us to save our energy for the promenade along the river Nervión. On a still winter’s day, this city aspect was pleasing to the eye, providing a moving atmosphere that coloured our memories. Our city preview from the previous day was fast fading from my mind. 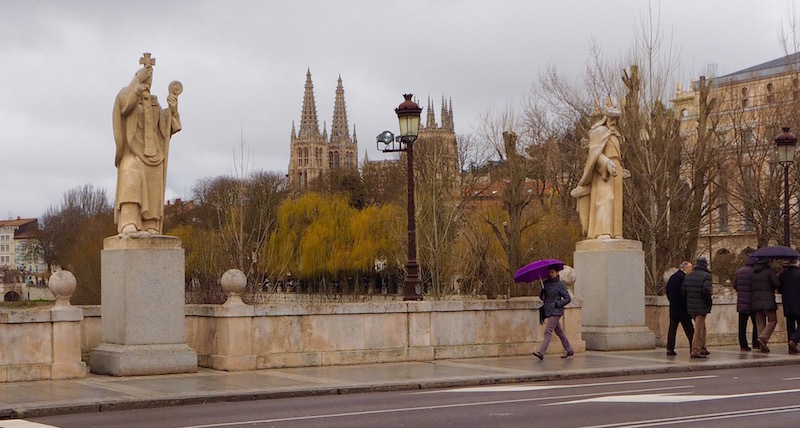 The architecture bordering the river, (that has its source in Burgos), is an eclectic mix of colonial, modern and medieval and it fringes the river banks with a certain je ne sais quoi. 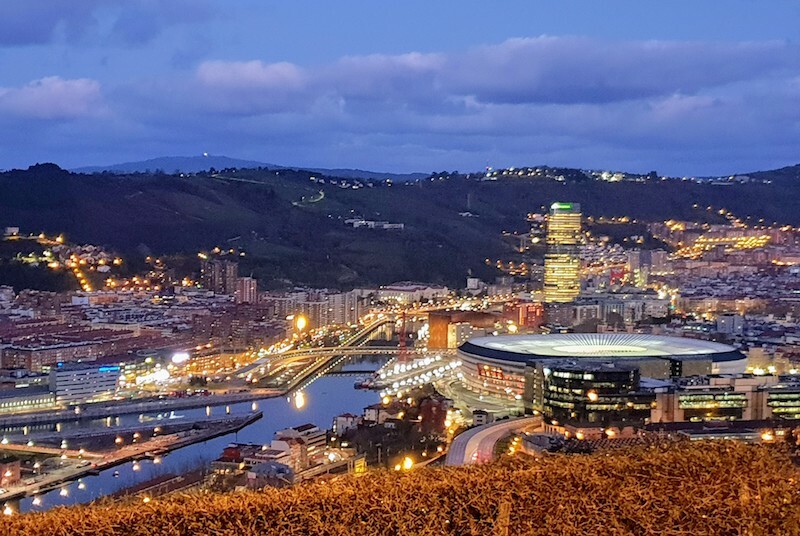 Whilst Bilbao, as the most active shipping port second only to Barcelona, has obvious roots in industry, make no mistake – this city is rebirthing and presenting its creative transformation to its European counterparts. 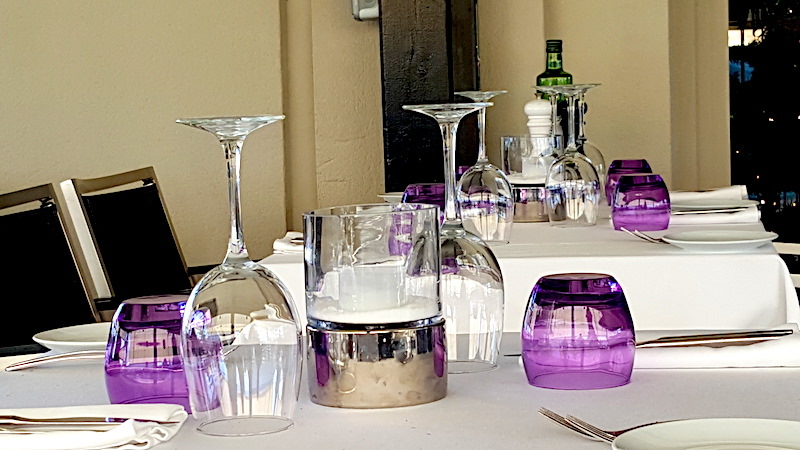 Check out our gallery of pics below. For now though let me share with you the virtues of the Guggenheim. Although I am not steeped in knowledge about the museum, I just knew I wanted to visit. I had heard its reputation for being one of the most incredible pieces of architectural art in the world and that alone made me want to go. And there’s no doubt that it is more grand than the grandest thing you can imagine. Our arrival at the Guggenheim could not be mistaken as this magnificent curvaceous beauty seemed to rise up from the industrial port’s ashes with grace and power. It is not an understated building and with pieces of artwork around the outside, I was captivated before I even entered its doors. Yet enter we must, as this was an experience I had been waiting for. We paid our €16 per person and passed through the well guarded security. There are three levels, each one offering a slightly different artistic theme. The first, Room Zero blew my mind and messed with my balance. A mirrored room gives an impression of Alice in Wonderland and as I watched the looping video, the way the images bounced off the glass walls is quite magnetic, making 3D seem like child’s play. Accompanied by our audio guides, which come as part of the entrance fee, we learnt about the museum’s design by Canadian-born American architect Frank Gehry. 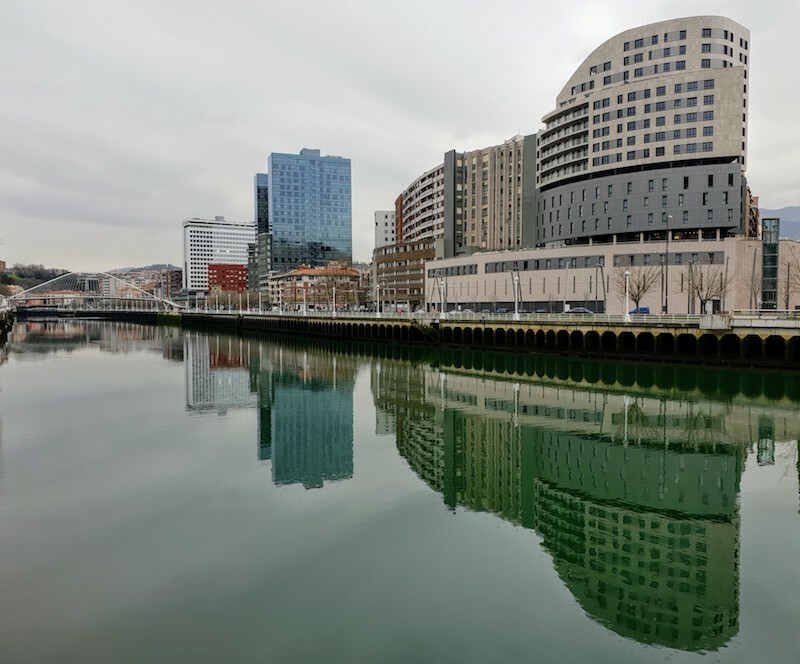 The huge project came to fruition in October 1997 and has transformed the dockland water’s edge image beyond all recognition. Built in titanium, glass and limestone, this is a masterpiece, which in different lights takes on completely different faces. And in many ways, you could almost be satisfied by seeing the outside of the museum such is its craft and beauty. Although the inside will challenge you in more ways than one. 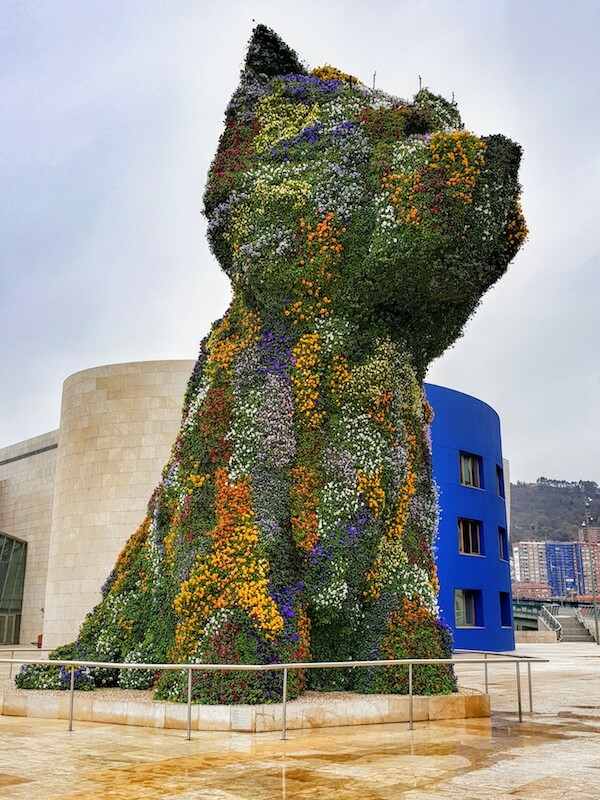 With an open atrium in the museum’s heart, Bilbao’s newest creation cries out to be admired. Splendid are its curves. Magnificent are its angular glass windows and resplendent are its halls that house such dynamic pieces of work. 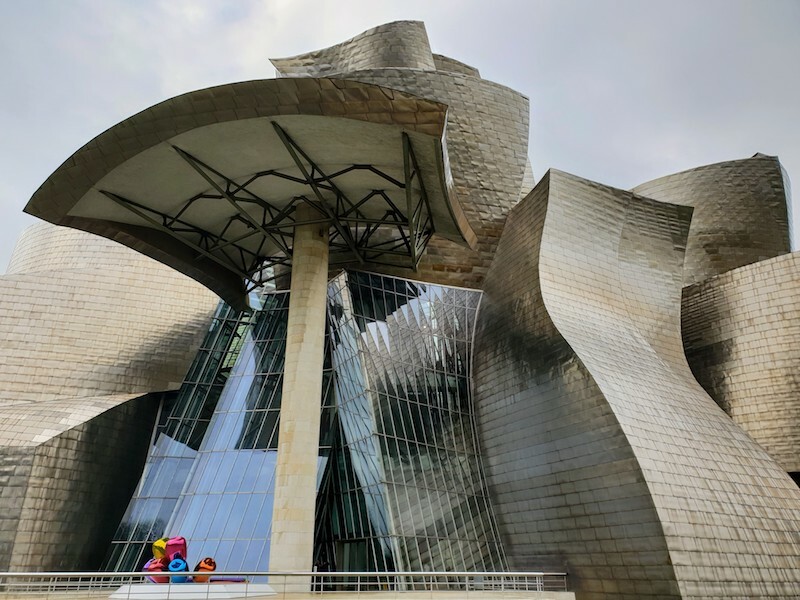 From Picasso to Van Gogh, Andy Warhol and a host of other artists from decades past, the Guggenheim is a centre-piece for self-expression and an almost eccentric interpretation of the world. Well that’s how it seemed to me. The first floor was a real challenge. The descriptions on the walls alone introduced a whole new language to me that provoked intellectual thought. If only I had been able to photograph them, I could have convey their linguistic demands more eloquently. The halls are intriguing, leaving you wondering whether these minimalistic white washed walls were a stroke of brilliance or an obscene waste of money. One room simply had two televisions playing news from CNN. Another had memorabilia stuck to the walls with an edition of The Sun catching my eye. To the modernistic gallery of contemporary work that challenges our concept of space and time. The modern world confronted by artists set on complementing progression and challenging the very heart of the world’s evolution. One of my favourite pieces was The Tent without a Signal. A 10ft tent-like construction, which inside simply held a circular set of metal benches. An odd sight for an art museum, although the artist has made a huge statement to technology and how it consumes our lives behind our devices. The tent covering is made from metallic fibres that scramble mobile phone signals, rendering them useless. The space is therefore held as a sanctuary to profound silence that allows the audience to truly contemplate the depth of their souls. This seriously appealed to me as a Meditation Teacher. The other incredible hall is a permanent feature called The Matter of Time. Artist Richard Serra’s ‘rumination on the physicality of space and the nature of sculpture’ offers a playground for adults. With enormous spiral structures made from steel you are invited to walk through their metallic form. It felt oddly like a Universal truth – such a small speck in an expanse of space. Weaving my way through the curves and the mazes, I felt transported into an out-of-world experience where for a moment, fear set in as I realised that I could be on another planet. And yet when viewed from the upper atrium, their structures were so simple and yet the steel designs challenged my spirit through that simplicity. 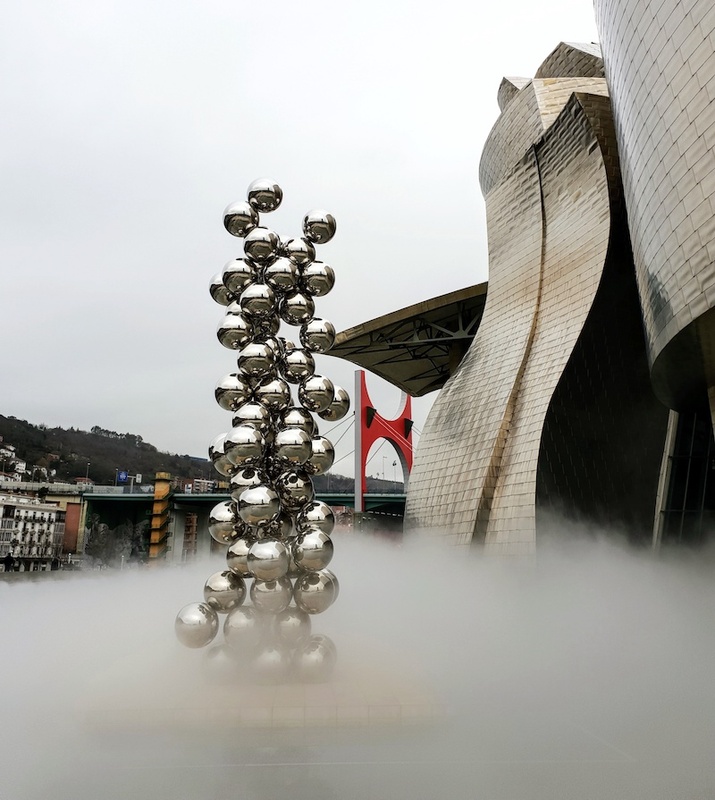 Leaving the museum, we were engulfed in a mist – as if in one last artist act of creativity; the Guggenheim’s moat came alive, piquing my curiosity. Every last bit of detail is invested in provoking the artist within. I highly recommend visiting this sensory journey that is so much more than a museum. 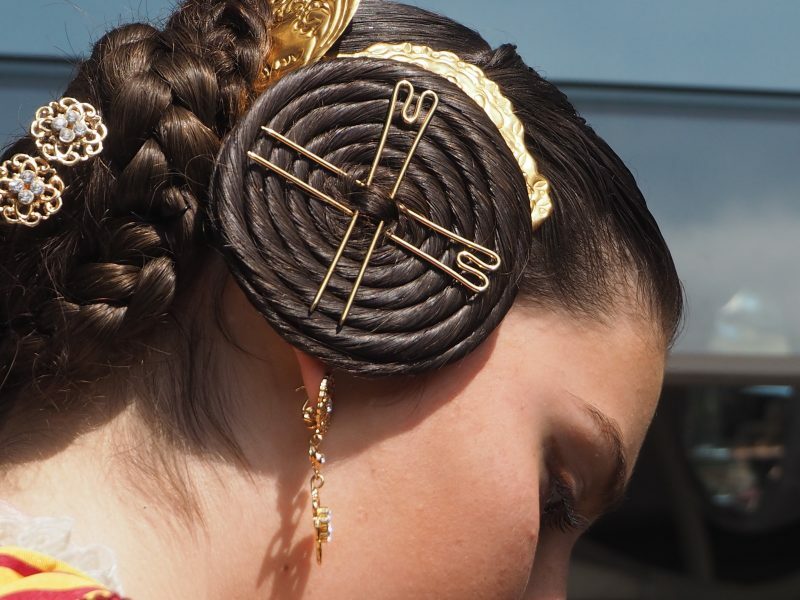 It is architecture, craft, imagination and self-expression in their very purest forms. And it has to be experienced, just once in your life. 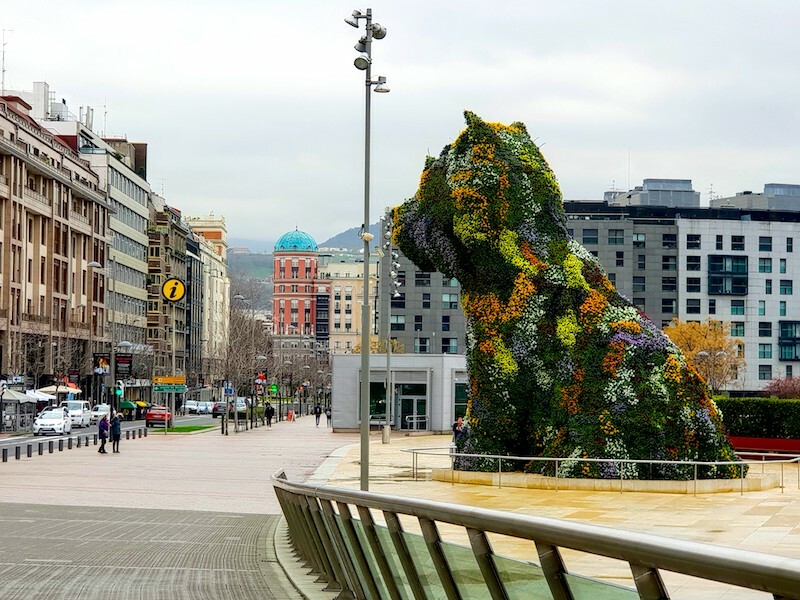 Bilbao has been built on a foundation of industry and trade and yet is embracing its evolution into a contemporary city. 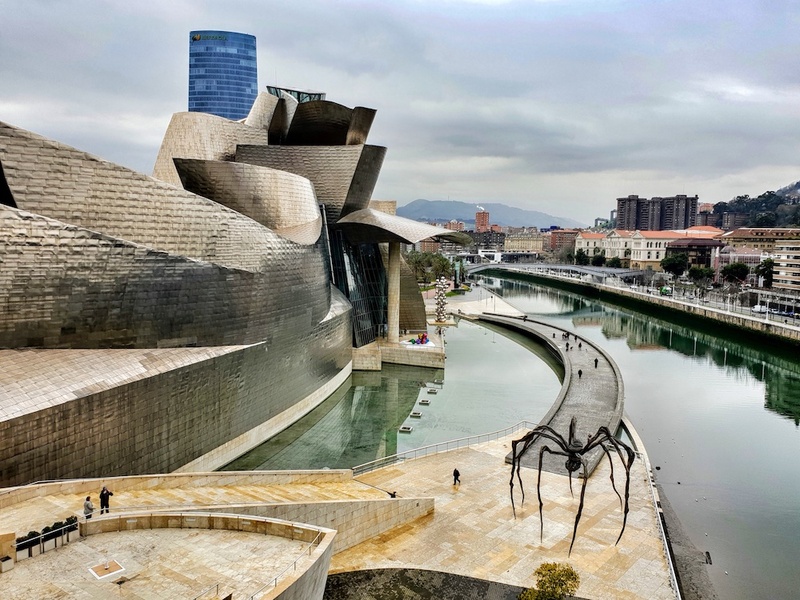 It does still have some way to go, although with UNESCO bridges and of course its brain-child the Guggenheim, Bilbao is redefining itself year on year. The Guggenheim museum is closed on Mondays. Not all the Guggenheim exhibitions will always be open as often they will be setting up halls for new presentations, so better check before you visit. There are no photos or videos allowed in the museum halls so don’t be tempted as there are guardians everywhere. 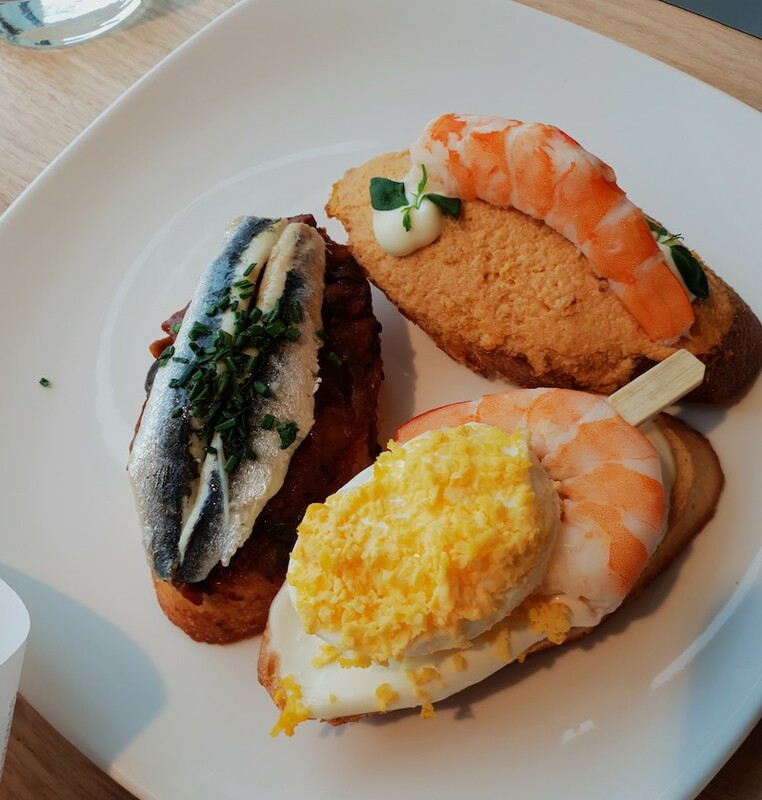 The Guggenheim Bar is very nice offering a good deal on the local delicacy Pintxos – Tapas. 3 Tapas and a drink for €9. Don’t take large bags into the Guggenheim, as you will be required to store them in the cloakrooms. The shape and lights of the museum interior may cause some issues if you have sensitive eyes or migraine tendancies, so be aware of this before you enter. The Guggenheim is disabled friendly with lifts to each of the three floors. 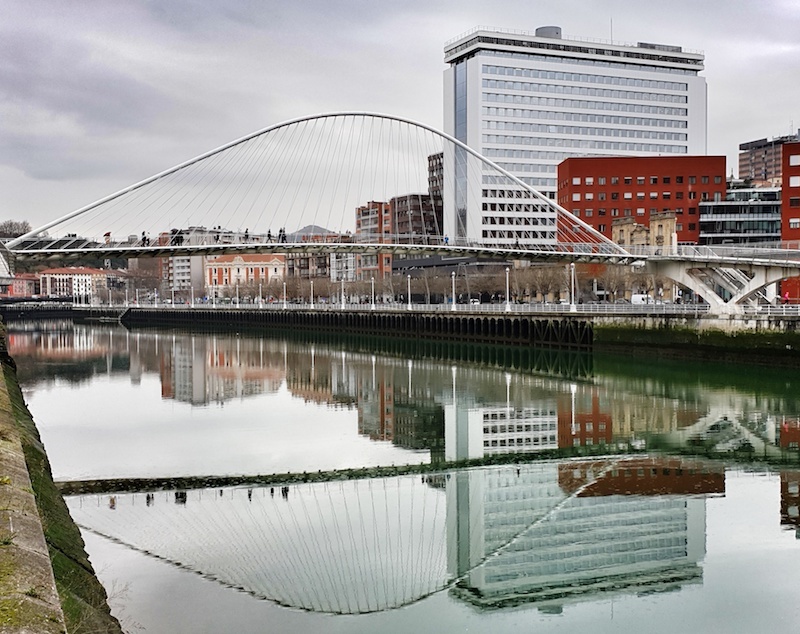 Getting around Bilbao is easy with the buses and trams that zig-zag the city’s network. Within half a day we had absorbed all we wanted from the city, most of which was within the hub of the Guggenheim itself. 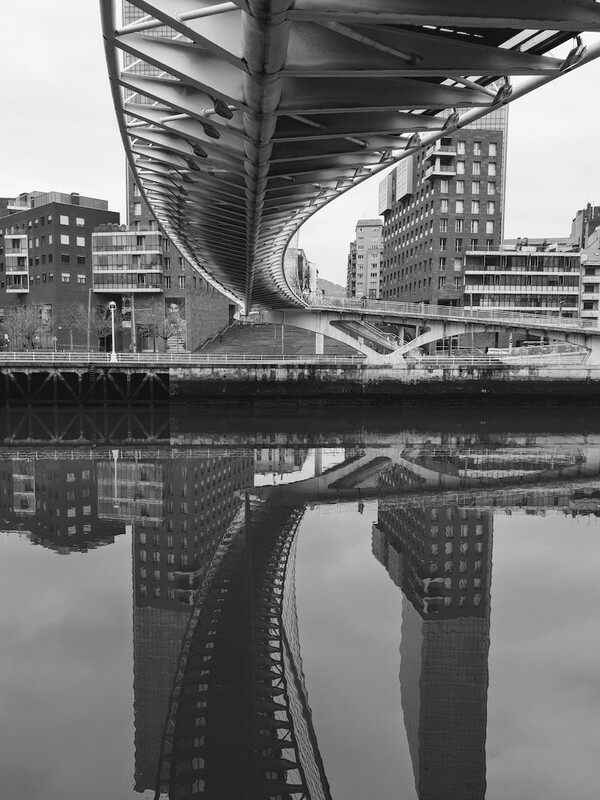 Unlike, say London, there are very few other major draws, except perhaps the 17 bridges that span the river and the Artxander funicular that takes you up to the mountain of the same name, giving you a great panorama of the city. 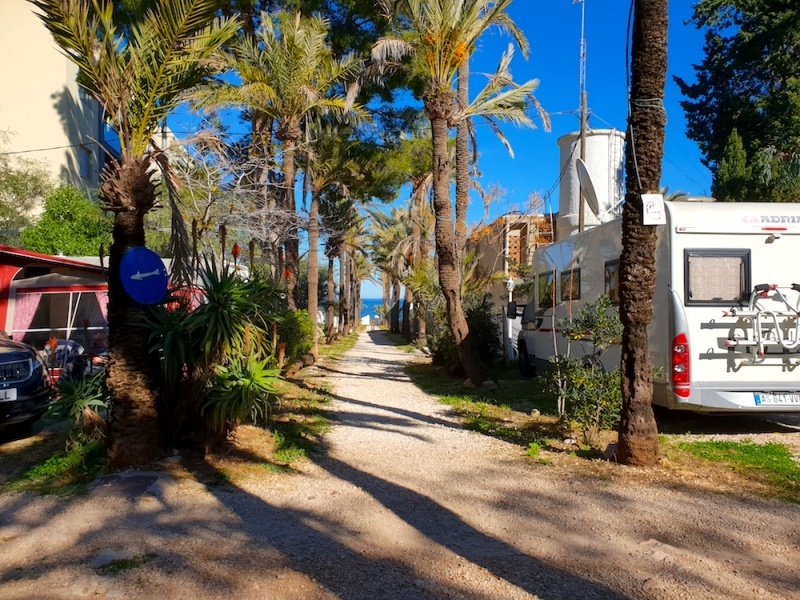 If you are visiting the city with your camper, The Kobeta Camping Aire (43.25955 -2.9636), which for €15 per night inclusive of electricity and services, gives you a great spot for watching the city and visiting by bus. If you come with dogs, remember that they are not allowed on buses without a muzzle, nor will they be allowed in the Guggenheim museum. And a sensible note! Wear comfortable shoes, as just walking from the old town to the Guggenheim and back again will reward you over 12,000 steps and 9 kms. Trust me, my blisters will confirm this very well. 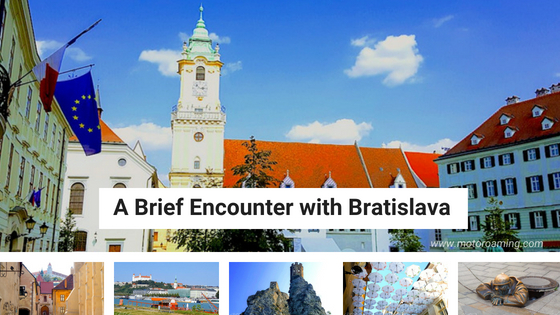 Overall I am so glad we visited and it reaffirms my thinking; despite my lack of love for cities, they hold great secrets and cultural treats, so visiting is an essential part of a traveller’s itinerary and my education, which feels influenced forever. Check out our final gallery below. Travelling through Spain over the last two years has been an enlightening experience that has taught us plenty, surprised us consistently and captivated us completely. 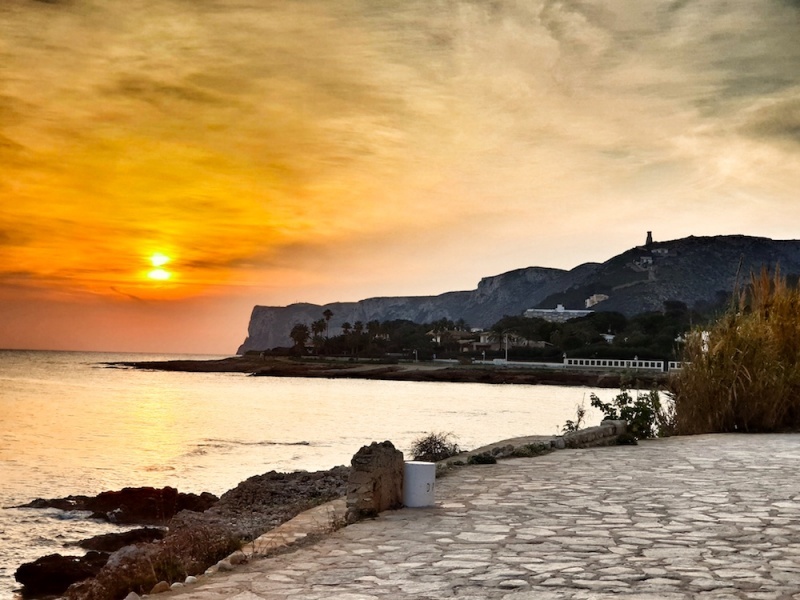 Ever since our first steps on these shores, when we set out on our nomadic adventure in March 2016, each of our three return trips to Spain have opened up our eyes to a rich culture, a diverse landscape and an enthralling history. Above all Spain has wriggled its way into our affections and allowed us to see beyond its ‘Costa’ reputation. A deep respect for this fascinating and bountiful country has grown within us and leaves us wanting more. 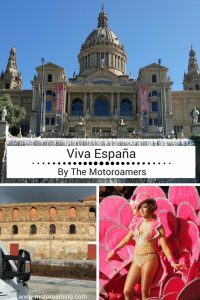 As we have completed this year’s exit from this delightful country, it feels appropriate to track back our Spanish travel trilogy – three visits in three separate years – in the vein hope to capture some of our adventures and highlights as we uncovered this much misunderstood southern European country. The Interactive Map below represents the Spanish adventure that we have embarked on and whilst it still remains an incomplete jigsaw, it has created enough intrigue for us to return each winter to put a few more pieces into our Spanish Masterpiece. 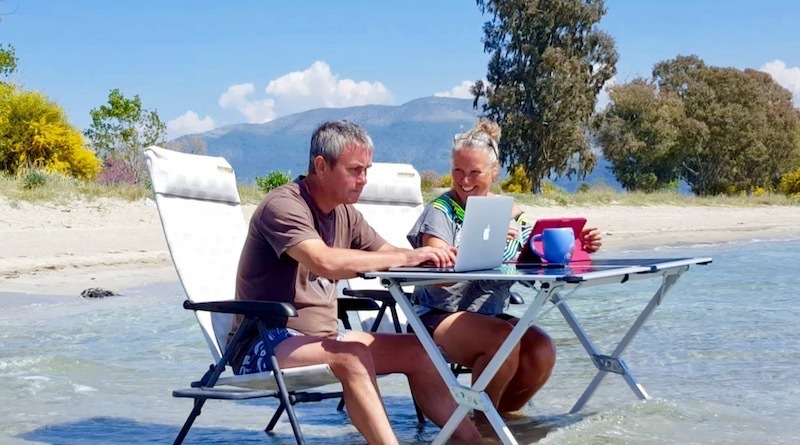 Click on the map for an extensive compilation of Points of Interest, campsites, wild spots, co-ordinates, images and links to old blogs and videos that we have taken during our time in this land of fiesta and passion. To accompany that we have offered a short write up on each of the seven regions we have allowed our wanderlust to play in the hope that it might inspire you to return to the map to pin point exactly where we’ve been and called home. 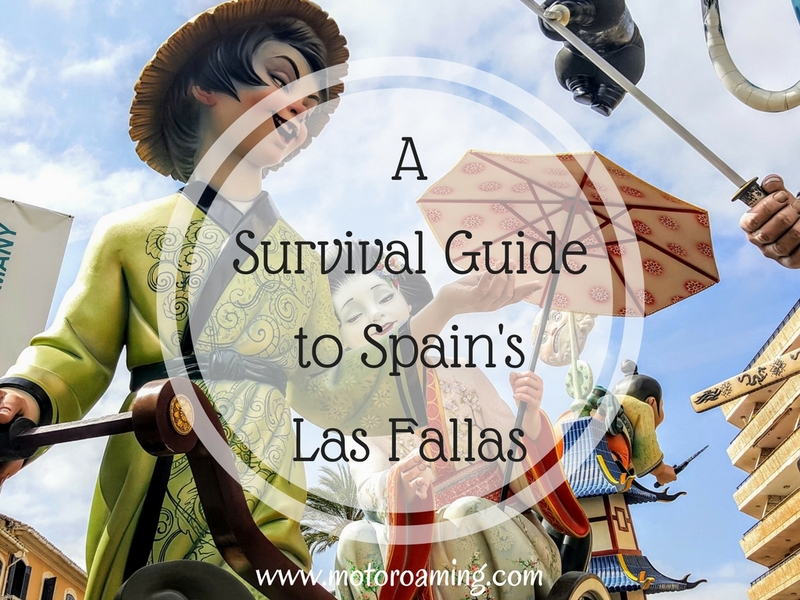 Enjoy this Spanish Compilation and let it whet your adventurous spirit. This landlocked region of north-eastern Spain cries out for attention as so many flock for the coastal fringes of Spain’s Costas. Although the sun seekers’ loss is a traveller’s gain as this northern territory offers history and scenery in poetic partnership. 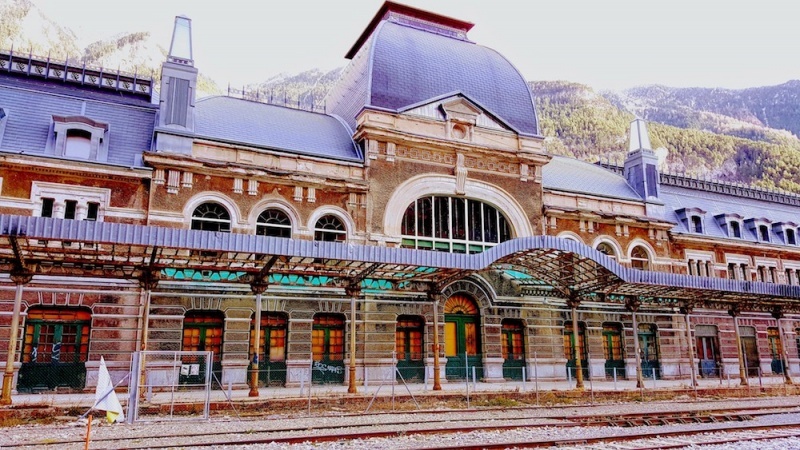 Aragon’s very first offering as you drive through the Somport Tunnel is the once grand, Canfranc Estacion, calling for you to rest your eyes upon its 365 windows and half a mile long platform. A ghost station that demands your respect even in its abandoned state. The mountains beyond offer you monasteries and chiselled hamlets with religious acclaim, not to mention the panoramic vistas across to the Pyrenean foothills. 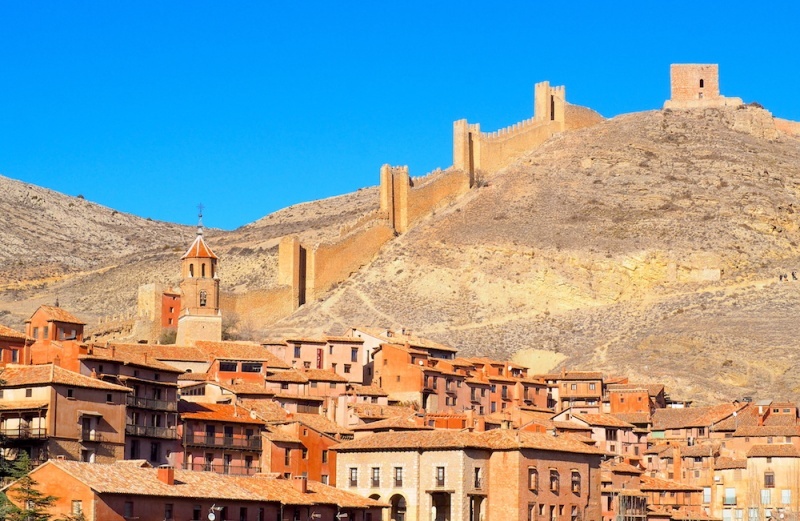 And of course you can’t pass by en route south without calling in to see Albarracín with its medieval wall-city, Moorish fort ruins and its 16th Century Cathedral. 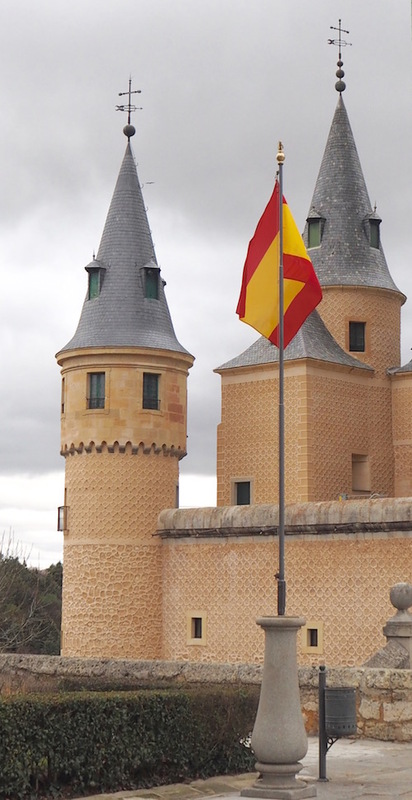 Perhaps a night in Teruel, Spain’s highest town will tempt you to observe its Mudéjar architecture, a fusion of Gothic and Islamic styles that is unique to the area. This is Spain’s second largest region stretching from its south-western most borders with Portugal right across to the south-east fringes. It is one of the most diverse regions as it binds together mountains, coast, wetland and dunes, embraced by the most enthralling historical wrapping you can imagine. With Christians fighting against the Moors, who from their North African neighbour, set out to conquer the whole region within four years. 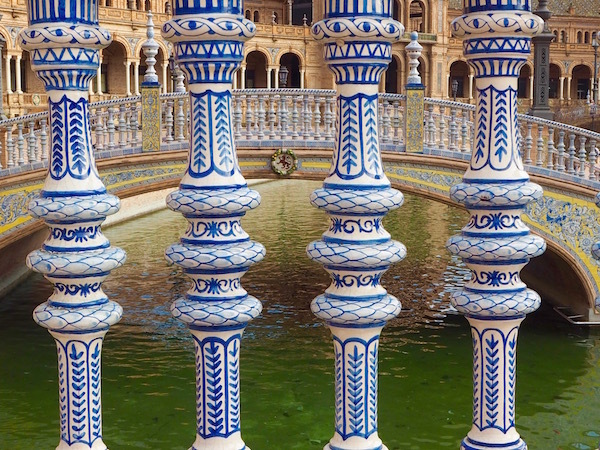 The Moor’s dominance is clear to see throughout the region with Cadiz, Granada, Seville and Cordoba show-casing their Moorish dominance and architectural influence. 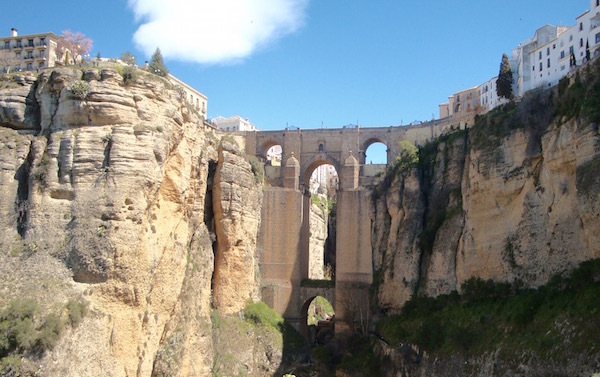 Although don’t be bewitched by their impressive buildings at the expense of Ronda, for its precarious habitation above the stunning El Tajo gorge is a sight to be seen. 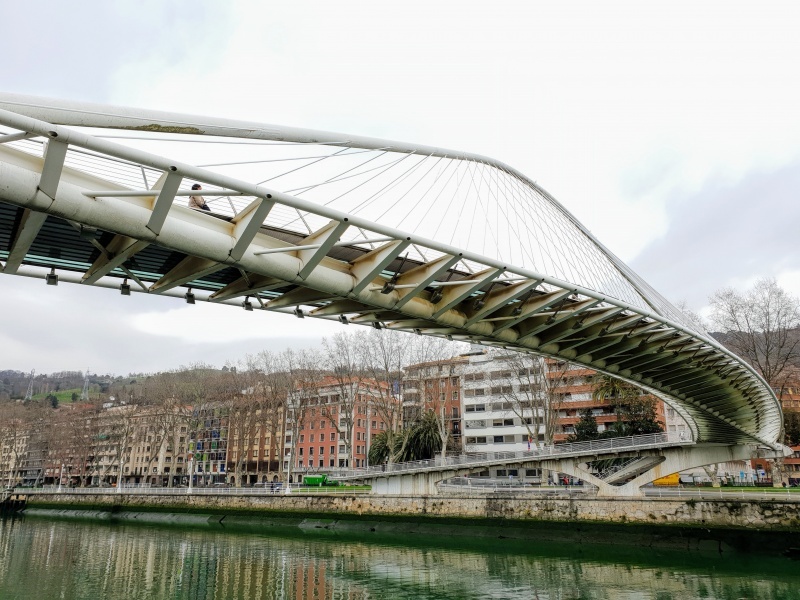 The iconic arches of the Puente Nuevo bridge built high above the valley floor, connects the old and new town and its atmospheric prowess certainly commands your attention. 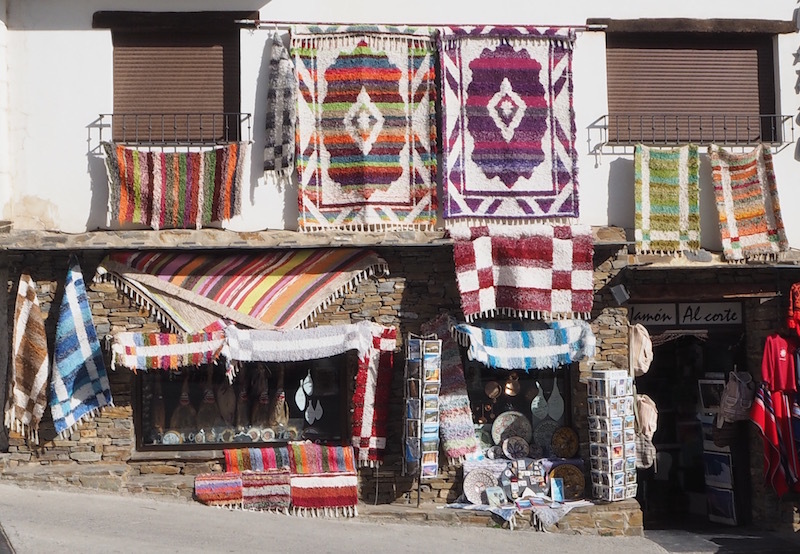 Deep in the mountains north of Cadiz, you will find the Pueblo Blancos – villages of built entirely of white stone, most of which are nestled within the heartland of the Sierra de Grazalema National Park. Grazalema is our favourites with its steep, cobbled streets and authentic village ambiance, you feel humbled by its beauty. 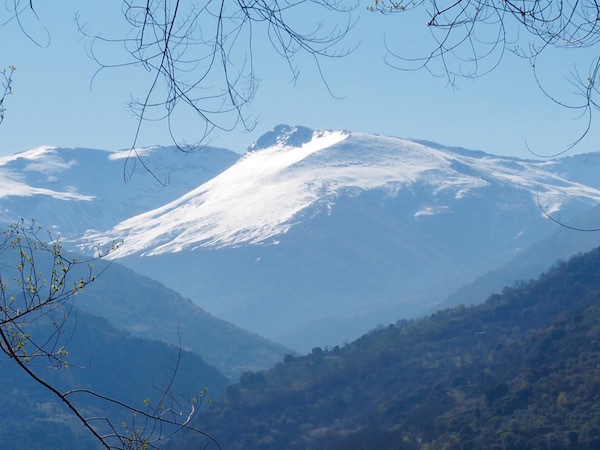 And just further east, past Granada the Sierra Nevadas provides humble abode to the isolated mountain retreats of Las Alpujarras – the most authentic place to experience Spanish artisans. The journey through the mountains is a delightful step back in time which will pique your cultural curiosity. To the far west, mention must be made to the diverse landscape of Doñana National Park – an important wetland area for wildlife in particular the protected Iberian Lynx and Imperial Eagle. Twinned with the Camargue region of southern France, Doñana is of significant importance and has become a UNESCO World Heritage site and whilst no doubt impressive – it is the draw of the eclectic, Wild West-style town of El Rocio that captivates many explorers with its cult status pilgrimage in late May. 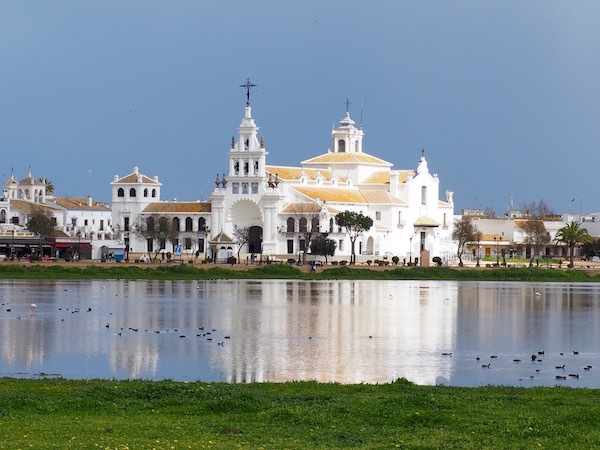 El Rocio defies description and is just one of those places you have to visit and see with your own eyes, although be warned if you go in the festival season in May (or to be more precise 50 days after Easter Sunday), you will be sharing the experience with 1 million other people intent of participating in this unique gathering of brotherhood members. 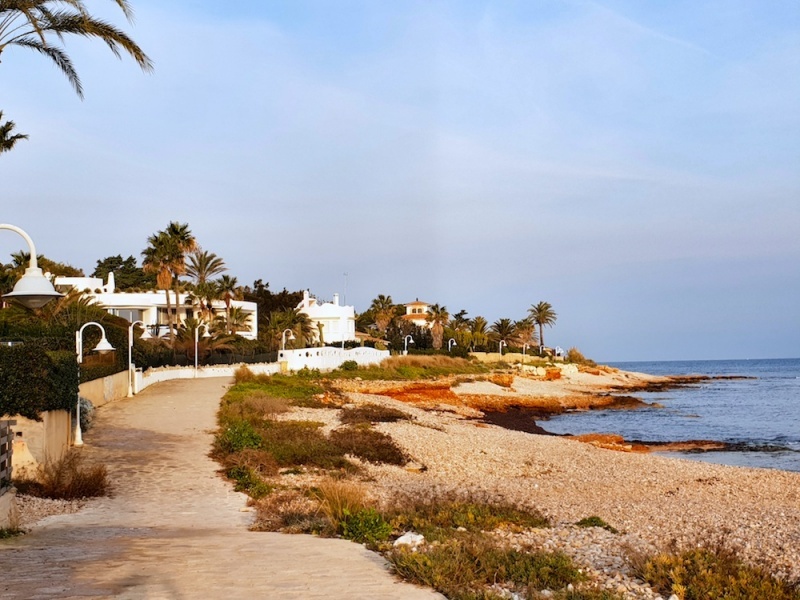 Whilst many descend upon the Costa del Sol with Marbella, Torremolinos and Malaga at its heart – it is beyond the sprawling mass of high-rises, villas and Golf Courses where you will find the truest and finest mountain experience. 50km from Malaga and the Guadalhorce National Park – Spain’s Lake District entices you into to hike this mountainous region. With special mention of course to the infamous El Caminito del Rey, one of Europe’s most dangerous walks through the canyons of the Garganta del Chorro, which is something that simply must be done. The Land Beyond Malaga is something else and must surely be witnessed by us. 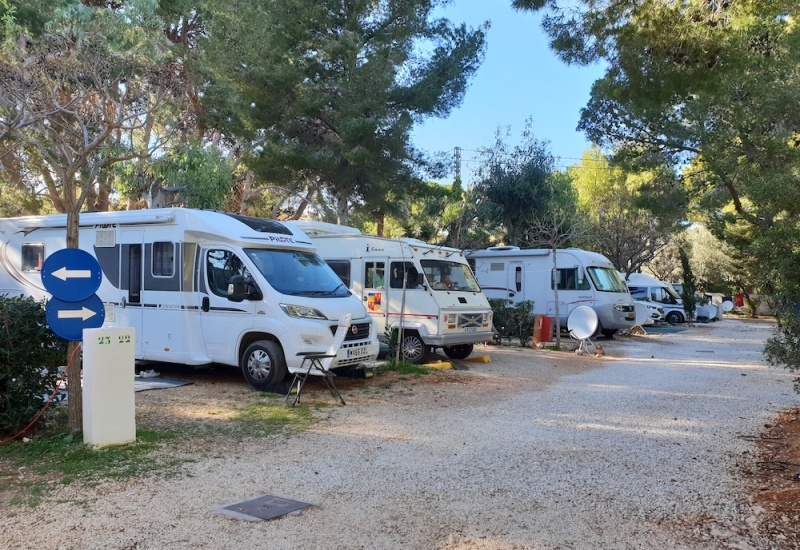 And last, and by no means least – if getting off the beaten track is an important part of your travel ethos, then the Sierra de Cazorla, Segura y Las Villas is the cherry on the cake. 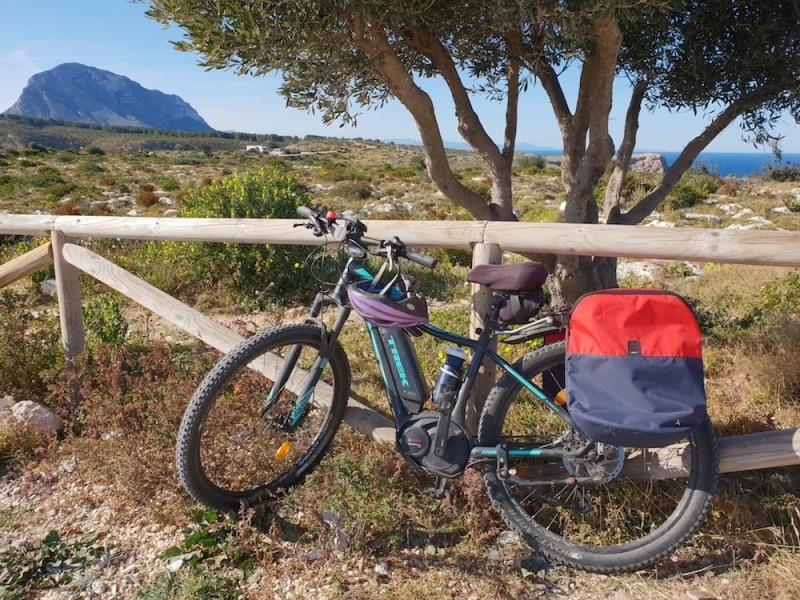 In the centre of Olive Grove central just east of Jaén, this mountain region which represents the largest National Park in Spain, is one of those places that has cameras clicking and visitors muttering the immortal words of ‘Ooh’ ‘Ah’ and ‘Wow’ several times a minute. So much wild beauty that the sandy beaches of the Costa’s simply can’t compete with – whilst pretty in their own way if you can see beyond the concrete jungle. 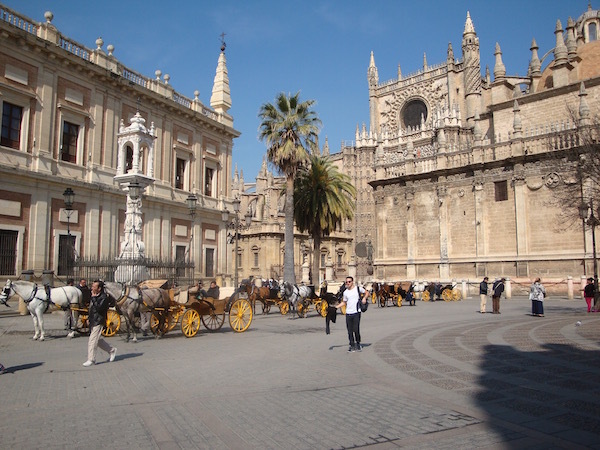 Andalucia – the most diverse and wondrous region of Spain. Having high anticipation of our Spanish exploration when we arrived early March to snow, we were somewhat amused. 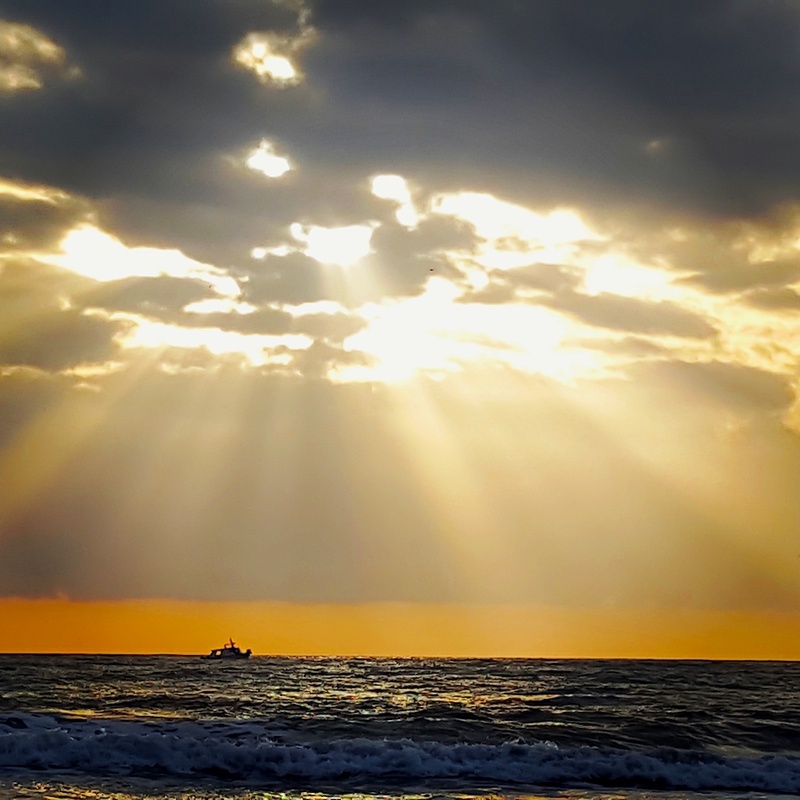 Where was the iconic sunburst that we had planned on enjoying? Where was that illusive blue sky that Spain is so famous for? It certainly wasn’t in this northern region of Spain. Still, regardless of minus temperatures, we were determined to enjoy our virgin experience of this mighty country and especially as there are three major UNESCO sites in a golden triangle. 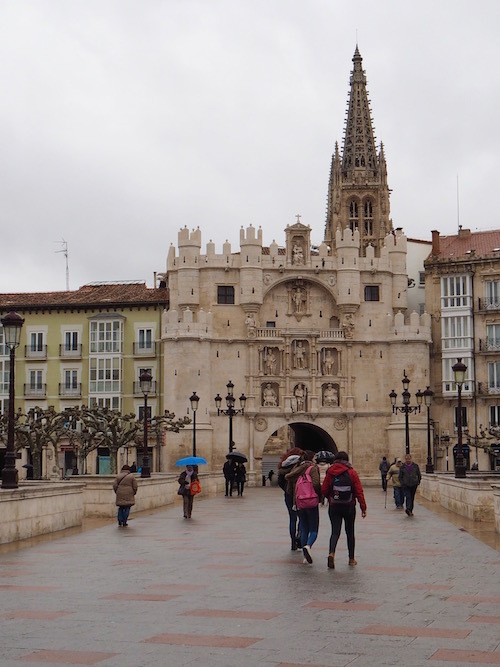 First of all you have Burgos, capital to this Castilla region and packing a mighty punch with its ‘still in tact’ medieval Cathedral. Still in tact is a gross exaggeration as this architectural feat defies the laws of erosion. 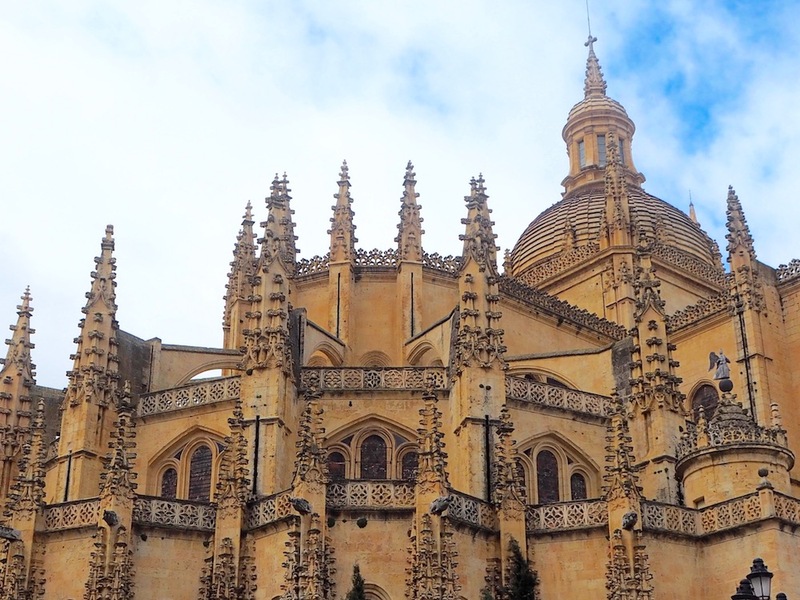 This is a fine example of Gothic design and is most famous for its tomb of El Cid. Entry is only €7 and to walk around this stunning piece of art – whether you love churches or not, quite honestly is irrelevant. You cannot walk away from this experience without being humbled by its prominence. 2.5hrs down the road you will find your second UNESCO site and this was our favourite of the three. As from the moment you walk from the origins of the immaculate Roman aqueduct down the steps towards the old town, you realise that Segovia is full of historical splendour. Cobbled streets that wind their ways uphill give you a great vista across the Spanish landscape and within the city walls, every corner you turn is yet another throwback in time. You could almost imagine yourself in a Dickensian novel. And whilst the cathedral is undoubtedly a work of art, it is the Disney-style Alcazar that truly owns the town and our affections. Whilst it has been renovated and in fact is still work in progress, this is a wonderful sight that goes well beyond the crass Instagram pose. Segovia’s buildings and her resident storks that often do a flypast, are just mesmerising and a day is simply not enough – just a flavour. Spend more time here if you can as its history and architectural charm will render you speechless. Just two more hours west towards the Portuguese border you will find the third UNESCO, which if you’re not already sensationalised-out, will leave you with warmth and charm. Salamanca different yet again to its siblings with the river and its bridges creating the first impression. With the somewhat sprawling new town on the other side of the river, you wonder whether the inner sanctum will stack up and that is a big resounding YES. Within the city walls you have a blend of cosmopolitan energy mixed with historical prowess that as you climb the steps towards the fortress gives you a bird’s eye view of the town below you. 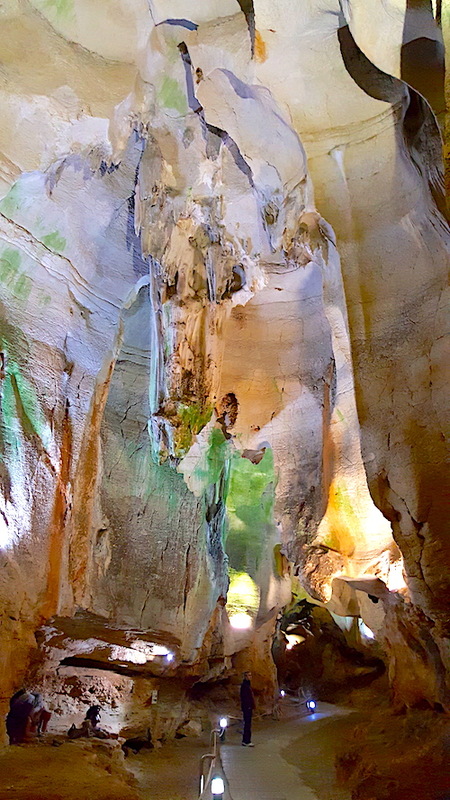 It is full of character and with its sandstone walls will entice you to stay awhile. 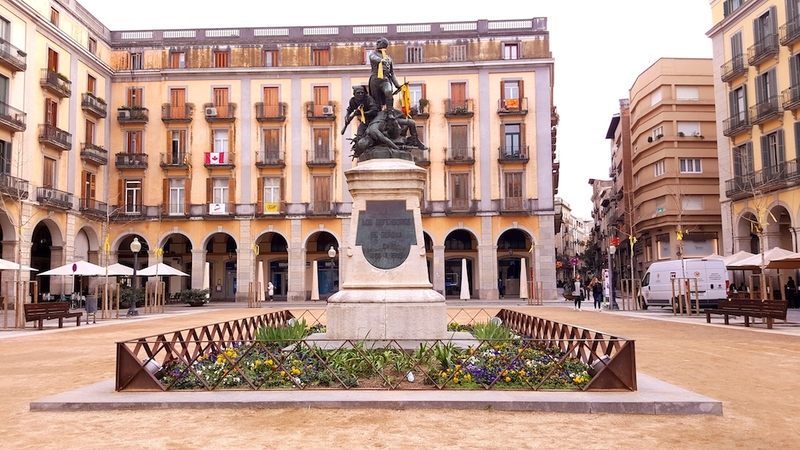 Receiving big media coverage in 2017/18, this north eastern region of Spain has been, and continues to battle for independence. Catalonian’s passion for their unique identity is evident around the region as their express their feelings with flags, posters and yellow ribbons. Irrespective of what the world may think about the politics, Catalonia is host to some seriously beautiful countryside, cities and culture. It packs a real punch when you look at Barcelona! What more could you ask for from a city? Art, class, history, architecture beauty, coast, texture. However you feel about cities, Barcelona will impress. 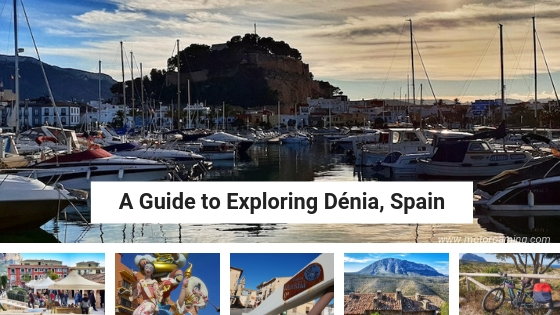 And that’s before you look beyond Barcelona and see the richness of Monserrat and the limestone pinnacles that rise out of the earth, housing the most incredible Monastery. 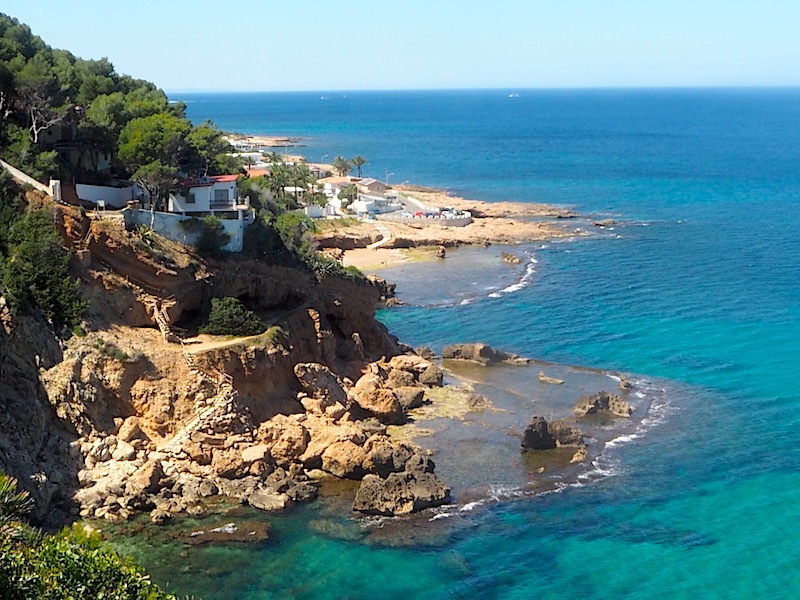 And what of the charming seaside town of Sitges? 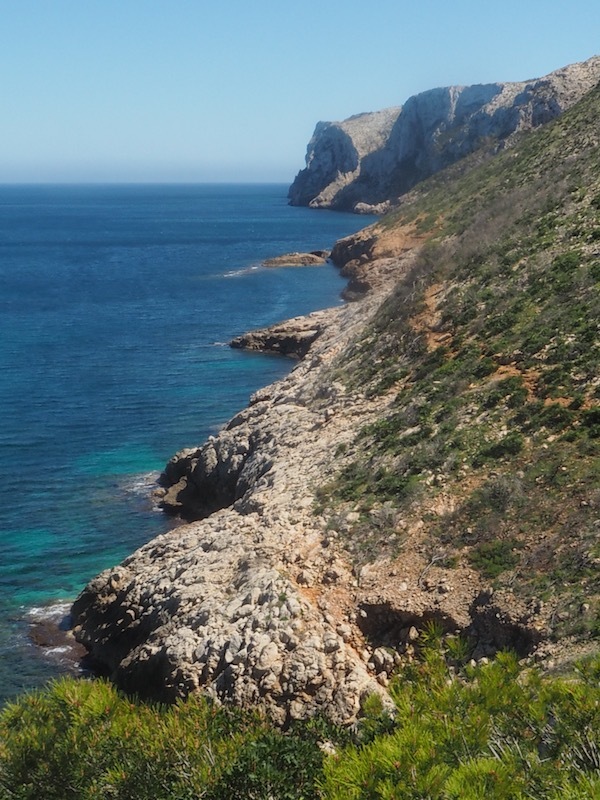 These are just some of Catalonia’s gems that need our time and admiration. 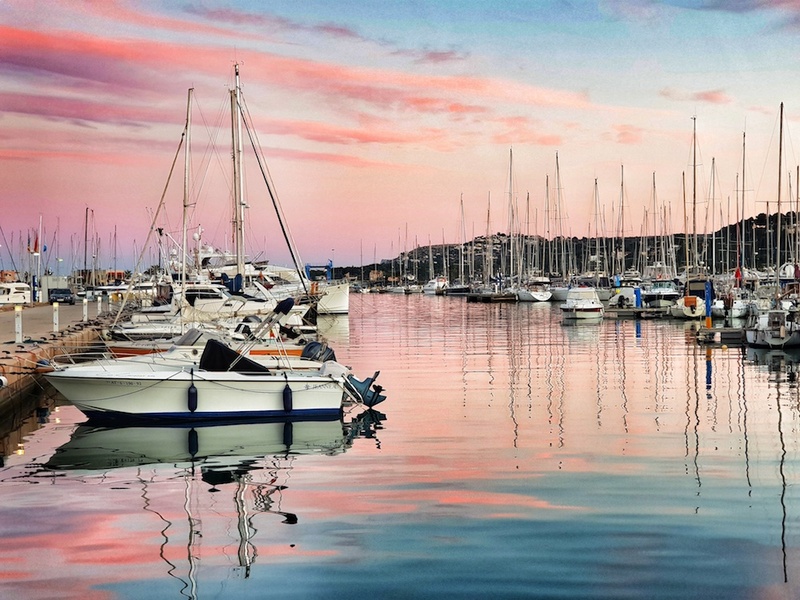 The Costa Brava region is delightful – a craggy coast with hidden bays, peninsulars and a classier waterfront than its southern cousins. 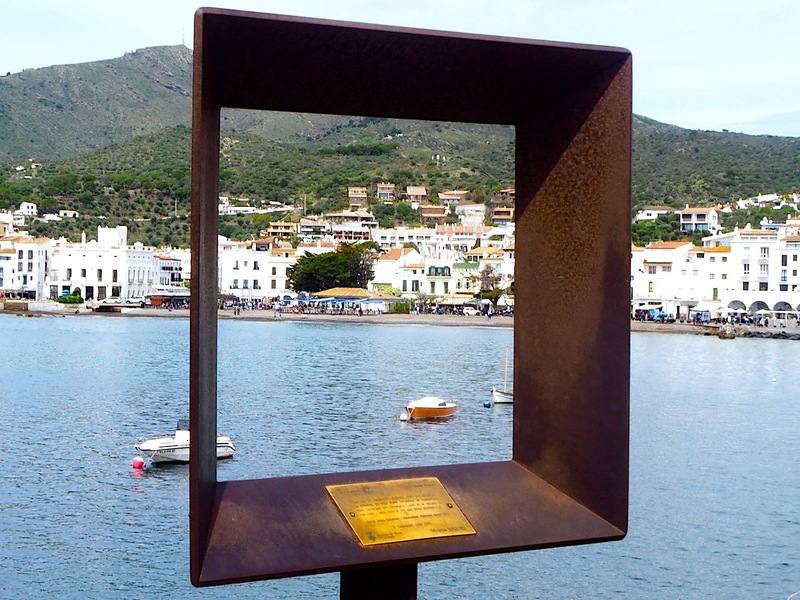 Secret villages that provide a creative retreat like the charm of Salvador Dali’s home Cadaques and L’Escala, just around the bay is another delightful place. 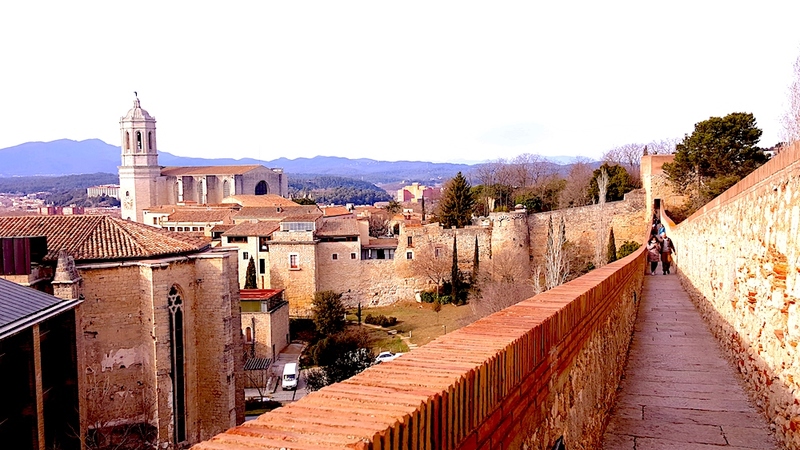 If you are looking for more of a city vibe then Girona might fit the bill, with its young community, music and flower festivals, we’re sure that its chic streets might lure you. If it’s off the beaten track you long for, then the likes of hiking in the Monserrat mountains or even an exploration of the small yet beautifully formed Peralada and Besalu could well appeal and it is tucked away in these countryside hamlets that you will find hidden history of warriors defending their land and diverse locals looking to live in harmony together. Not much has changed over the centuries. No tourists, just the ghosts of a time past and a few locals on a day out from the city. Catalonia is rich in landscape and history – both ancient and modern and all we can do is to watch their evolution and enjoy their offerings. 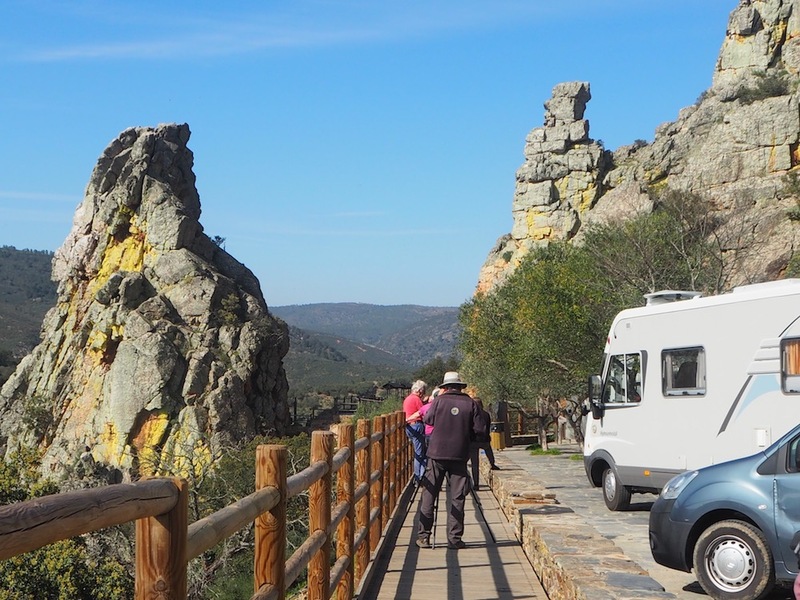 The highlight for us of this land-locked region has to be Spain’s largest and newest National Park – Monfragüe (pronounced Monfrauway). Tucked just east off of the highway, this vast Park is home to the most incredible wildlife; most significantly its raptors and other birdlife. 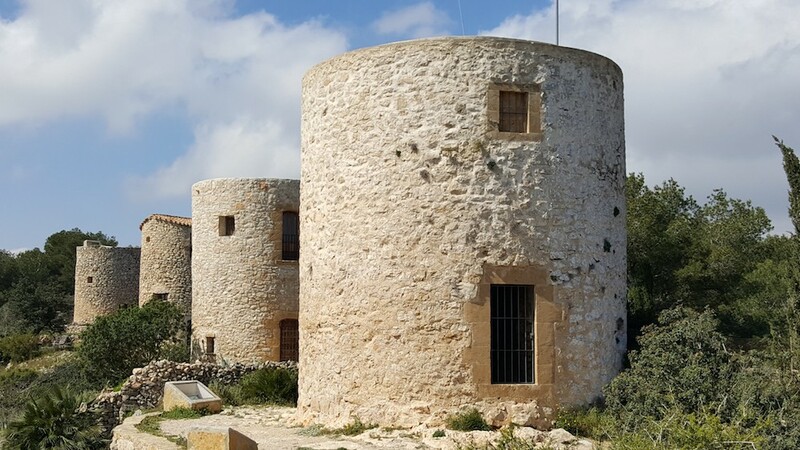 Monfrague with its reservoirs and rolling hills and mountains play host to 9th century castles with history seeping from every stone of its remnants to cave dwellings showing us a life way back when. 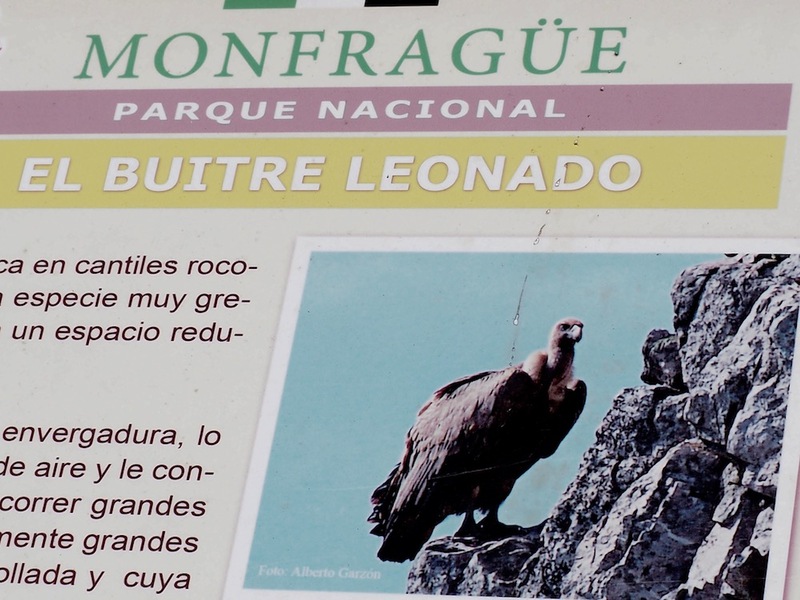 And if that isn’t enough, the park is home to many protected breeds of birds such as the majestic Black Stork, Egyptian Vultures, Imperial Eagles and White-bellied Swifts. 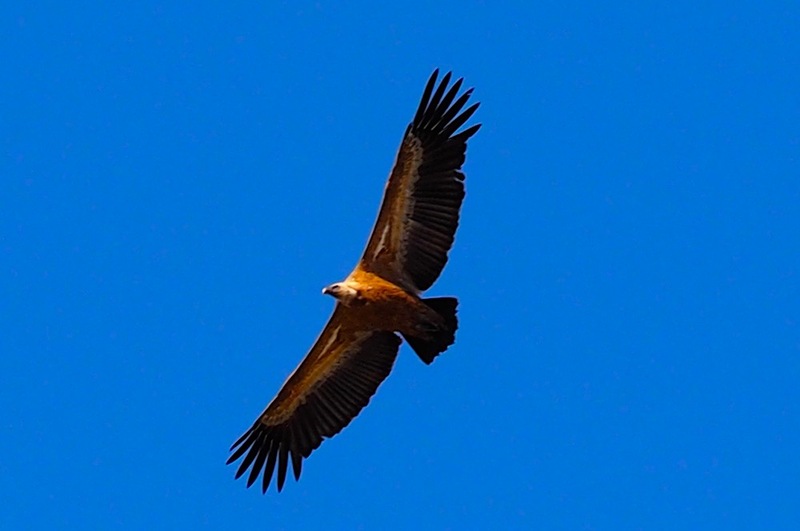 You can take a bird-watching tour and be guided around the birds’ safe havens, although taking your own tour will give you amble opportunity to see clouds of raptors take to the sky and nest up in the craggy rock faces. Whilst these region has undoubted other highlights, for us this was the stand-out and is a very special place to watch wildlife thrive in an unthreatened environment. It’s a timeless landscape that will have you enthralled. 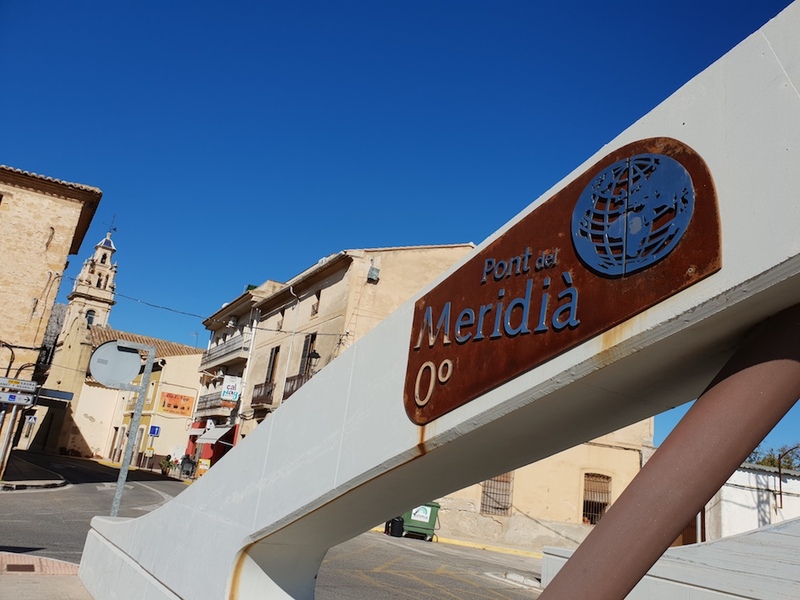 Murcia at first glance feels like it is one of the least explored regions we have visited. And yet as I pin-pointed our highlights I was surprised by how many amazing little gems we found. 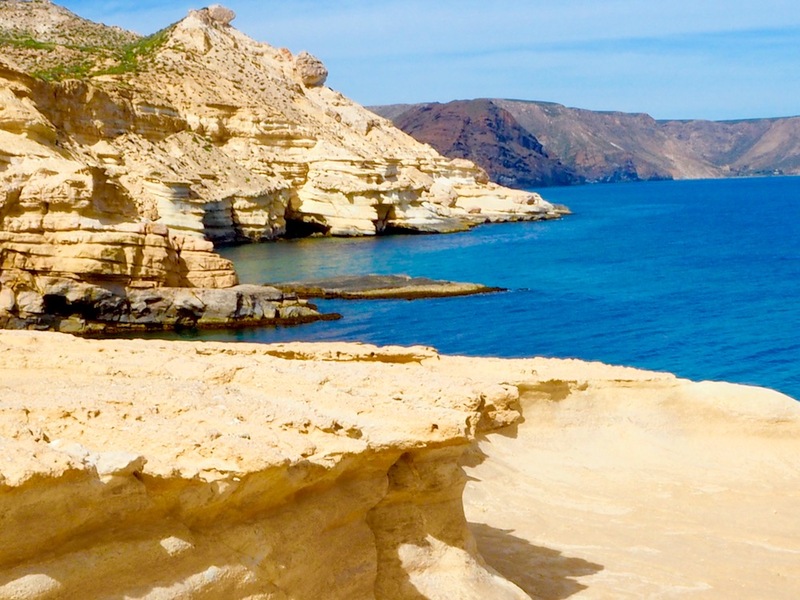 Beyond the sea of Greenhouses, which is central to Murcia’s economy, your wanderlust will be seriously exercised. 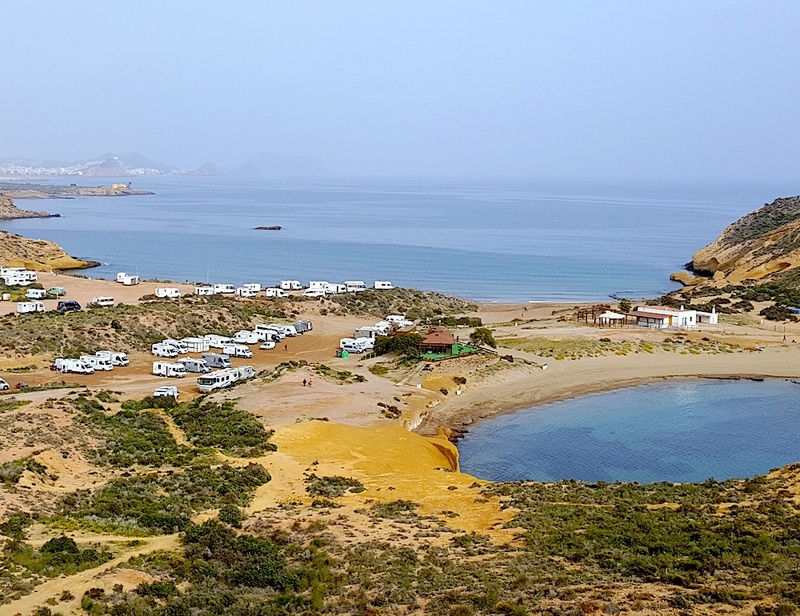 For example how about the delights of the craggy Cabo de Gata coastline where the rocks look like they have been hand-chiselled? Or the architecture from the Romans through to modern day designs in the vibrant city of Cartagena? Or the mesmerising display of Aguilas during its February carnival period that will have you feeling like you’re in Rio de Janeiro or somewhere in a Mardi Gras? 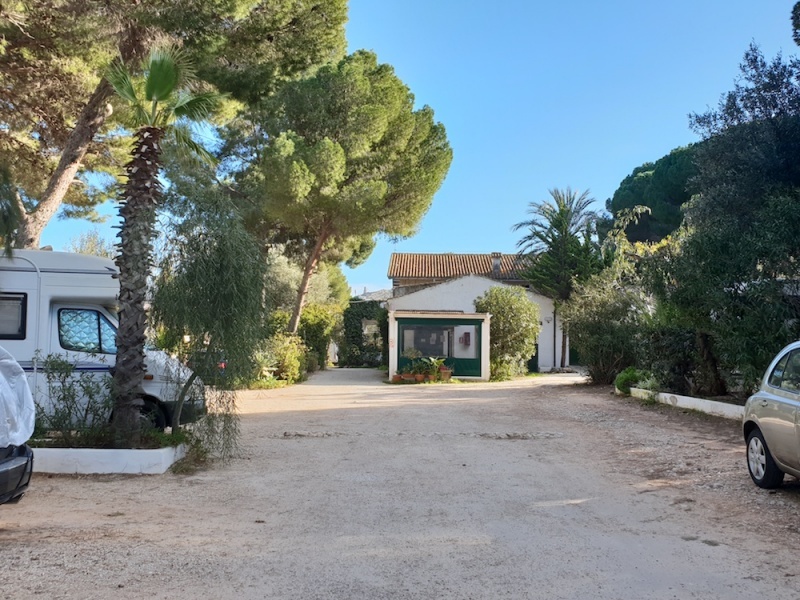 Perhaps something more tranquil and authentic would better suit your needs, if so then look no further than the Ricote Valley, just an hour away from the region’s capital Murcia. 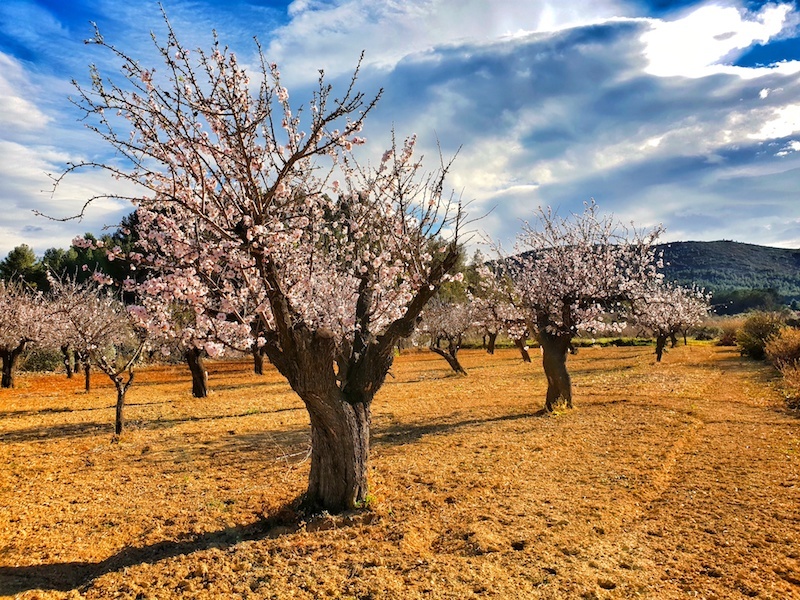 This quiet, off the beaten track valley is donned with citrus orchards that omit their mesmerising aromas and blossoms in early spring. 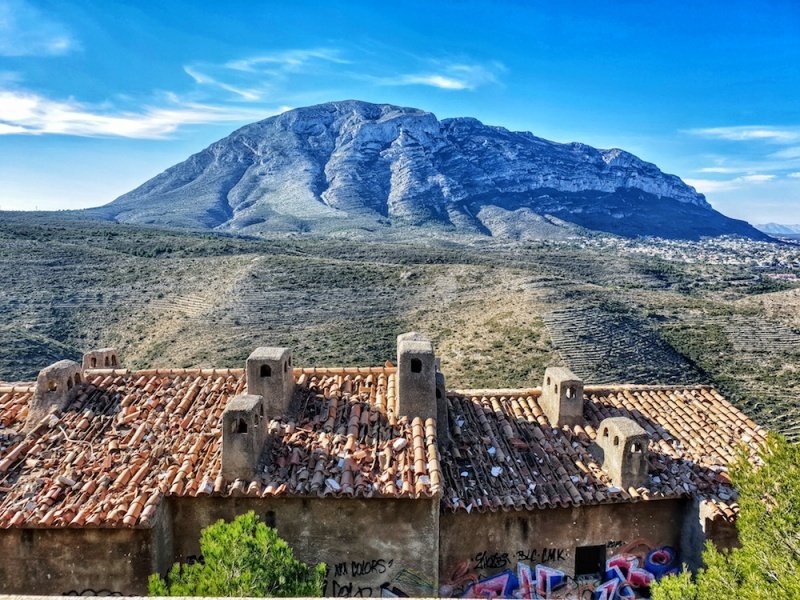 Authentic Spanish villages where no English will be spoken, allow you to be transported into a period where life has been untouched by modern technology. 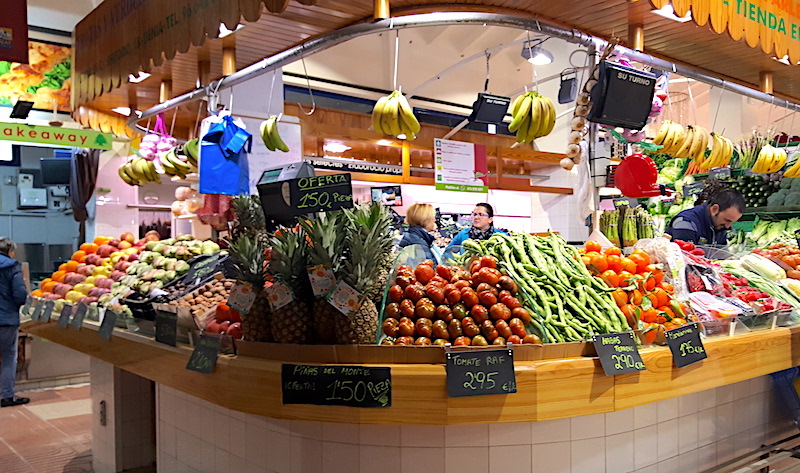 Bodegas, with their home-made liquor and markets full of local produce will make you feel like you are in the heart of traditional, old Spain, leaving behind the images of the greenhouses and hotel strewn coastlines. 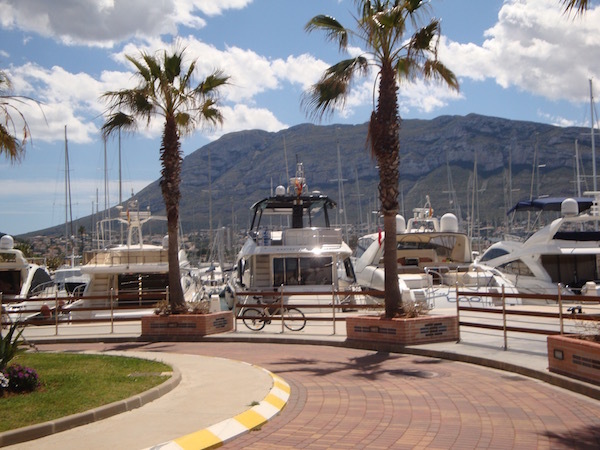 Murcia is a little bundle of delights and not just a region to be passed through to get to the resorts east and west. 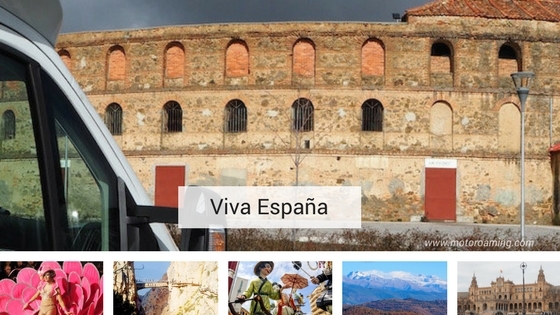 Charm, history and genuine Spanish life will magnetise here and ask you to stay awhile. 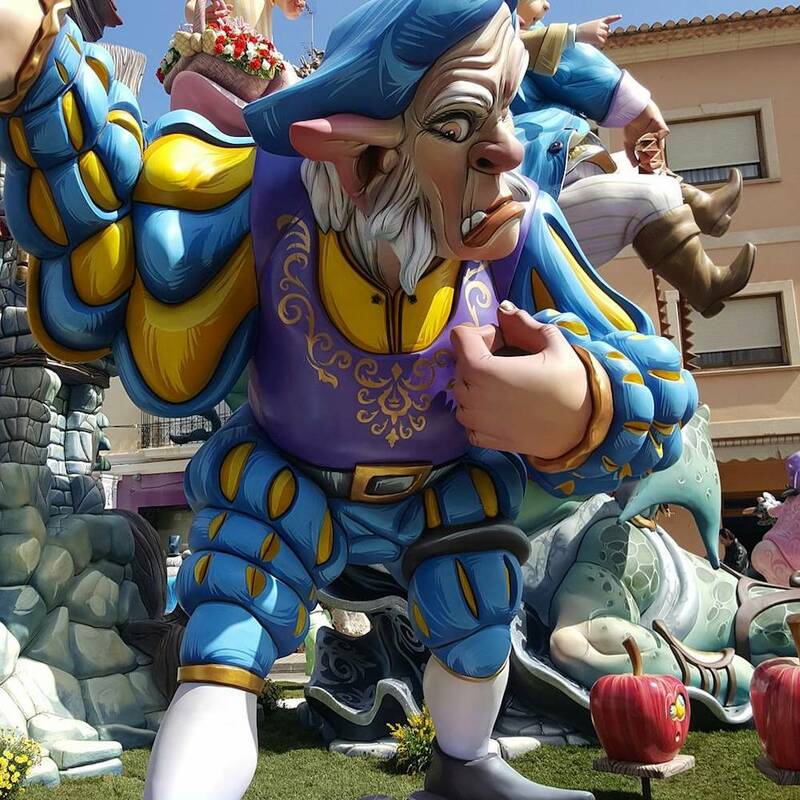 Reaching down to Benidorm and the Costas in the south, through to Denia and Castellon in the east and north of the region, the Valencian Community has tradition and fiestas at its heart. 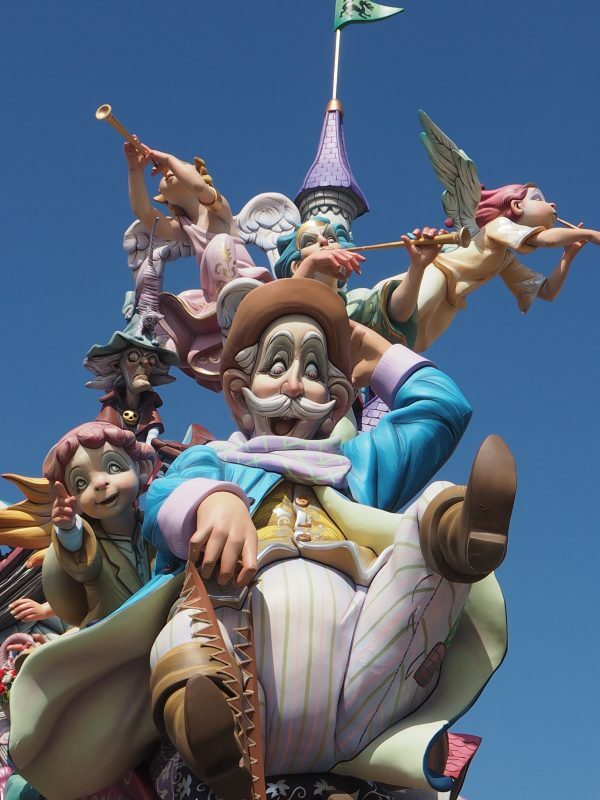 In the region’s capital, Valencia and Denia in particular, the greatest spectacular is in March where we defy you to not be engaged in this region’s atmospheric celebration of Las Fallas, where massive statues are built for St Joseph’s day on 19 March and then burnt a week later. 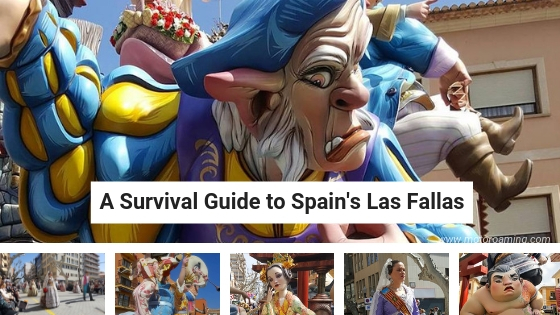 With processions, traditional costume and a party vibe, March in this region is one of the best places to be in Spain. And that’s without the Semana Santa celebrations. 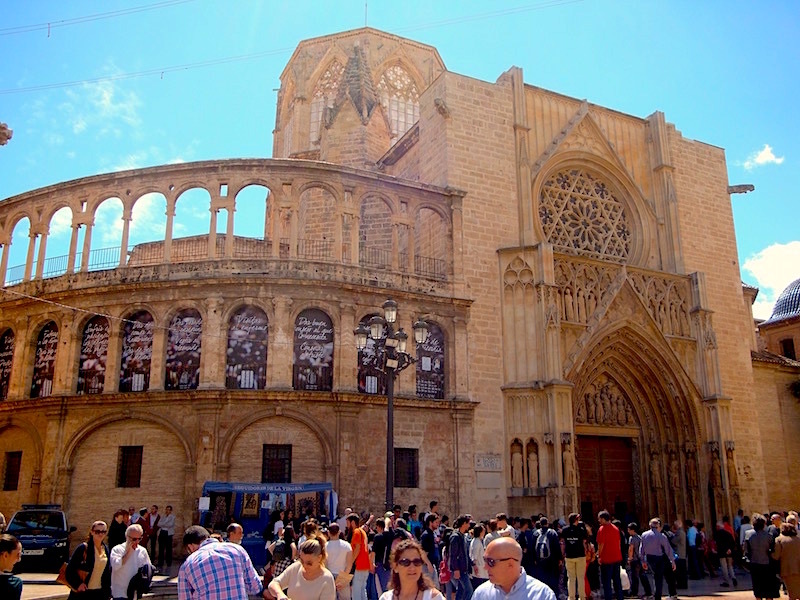 Valencia as a city satiates every single sense and appetite. 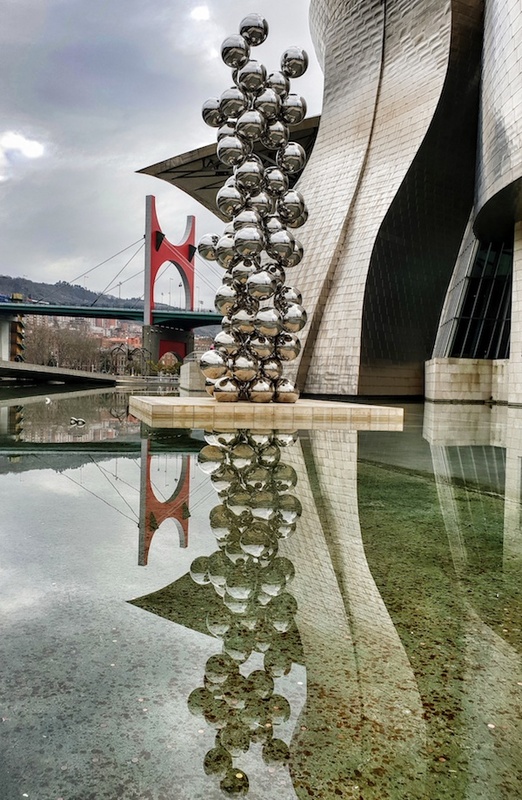 For those who love the modern scene, then the futuristic museums will wow you and as you walk through the yoga filled parks that place themselves in the old river bed, the old town and ancient bridges will delight too. 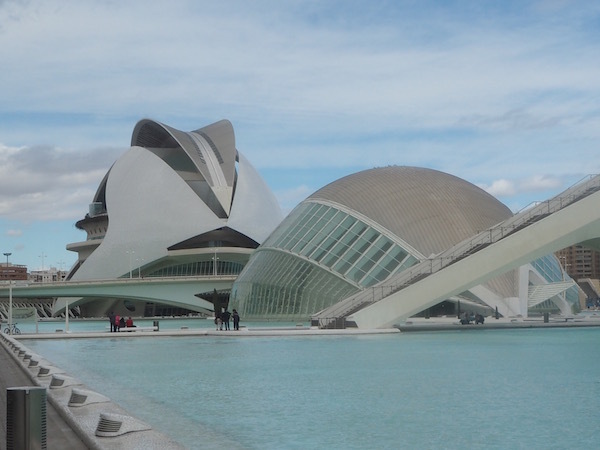 Valencia really has it all and is a wonderfully sensual city that I imagine you simply can’t get enough of. 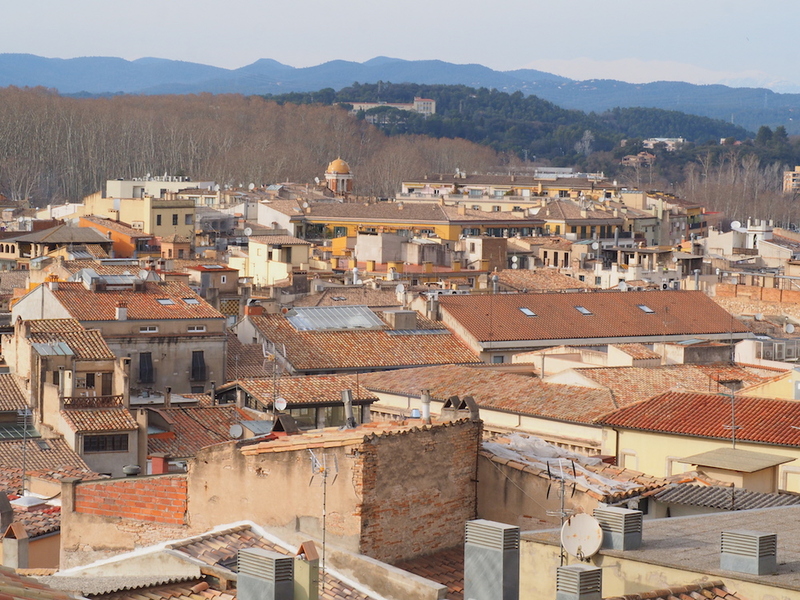 The first thing that struck us as we arrived in this Catalan city was how quiet it was. I suppose we have comparisons of London, Birmingham, Paris even to benchmark it against. Few cars lingered at the lights and few people were rushing from street to street. It was lunchtime and a Friday in mid-winter, so perhaps the Spanish siesta was dawning or may be this was just the city’s quiet heart-beat. As our exploration began, only the deep resonance of the Cathedral bells that vibrates through your veins and the odd fusion of seagulls and parakeets seem to pierce the silence. 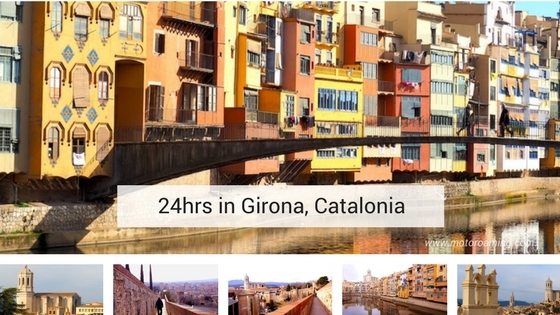 And yet Girona could so easily be missed off the travellers’ agenda in their haste to head south to coastal retreats or in the mad dash north with their luggage crammed with Rioja and Chorizo. And it is true for us too, as it has taken us until our third Spanish road trip to drop in and say ‘hi’. So what is our view of this proudly Catalonian city after our brief sojourn ? 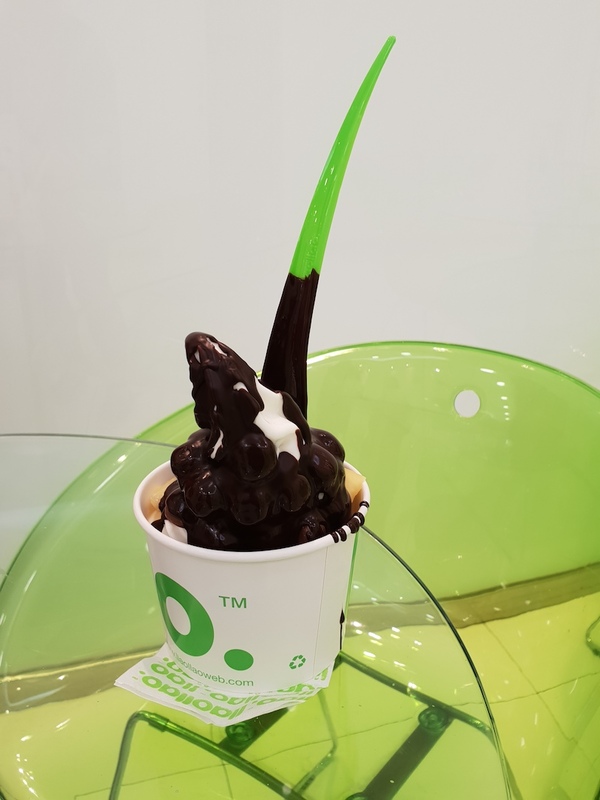 Let’s see if we can give you a flavour of our experiences and then may be it will prompt you to go and make up your own minds. As with most cities we’ve visited in the last two years of being on the road, there’s the old and new. And of course it is generally the ancient face we come to admire, as the outer fringes of industry and high rise where people create their homes and their business, has little to offer the curiosity seeker. Girona in that respect is no different. Nestled just below the foothills of the Pyrenees, Girona is blessed by stunning surroundings however your entry to the city is made. 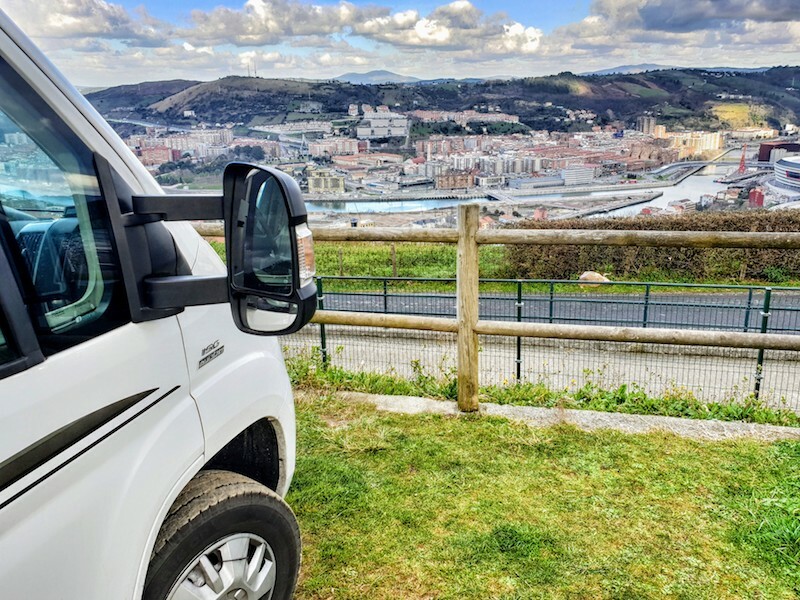 We came from the south west, Manresa to be precise, and our route through the snow-capped, densely forested mountains was a great set up for our city tour. 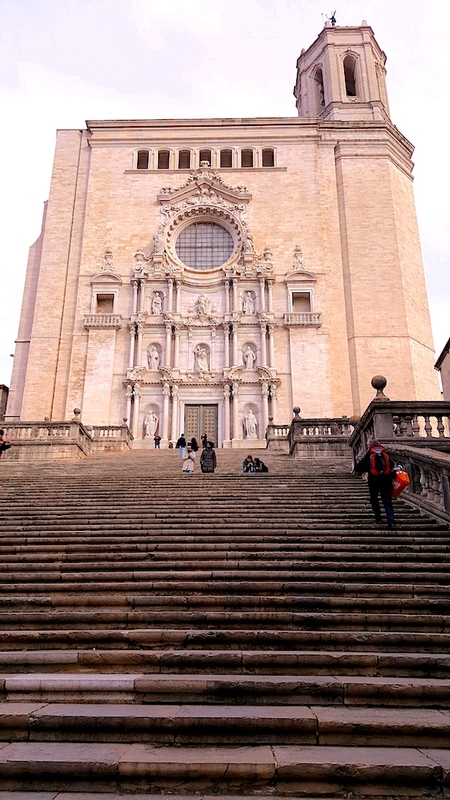 In the Spanish guide books there is little space dedicated to Girona. Barcelona and Seville certainly win the competition on that score. Although don’t be fooled by its lack of representation, as when we made our way from our inner-city camper park along the edge of the Devesa Park with its plethora of larch trees, I felt the anticipation grow. Despite the railway that dissects the old from the new, yet again we were struck by the lack of noise and buzz. A quiet station, few trains, only its metalic presence gave it away. And then our first real sight of this unassuming city, carrying a historical weight on its shoulders, emerged as we approached the river. 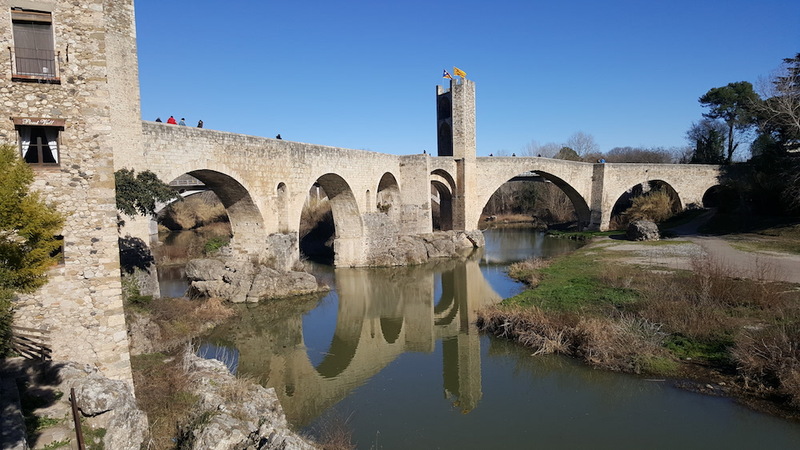 With copious bridges that span a trickling River Onyar before the Pyrenean snow melt fills the riverbed, we felt immediately transported into Girona’s soul. The colourful five or so storey buildings proudly hang their Catalan flags, propaganda and washing from their balconies like it’s a natural part of their decor, giving it an almost scruffy, yet lived in feel. It reminded us a lot of the Pontevecchia in Florence just on a smaller and quieter scale. Crossing the bridge felt symbolic as little did we realise that entry through the archway would take us into the heart of this somewhat somber city; the facades of the river-fronted buildings belying its inner sanctum. I’ve been trying to think of an adjective that best describes Girona’s historical old town and I think somber real does it for me. The streets, whilst full of Italian-style shops selling sumptuous clothes, shoes and leatherware are generally narrow and dark. I felt as though I wanted to sand blast the streets to bring it back to its former glory. Although in the darkness lies the truth of its history, so to remove it would be to strip away some of its legacy. 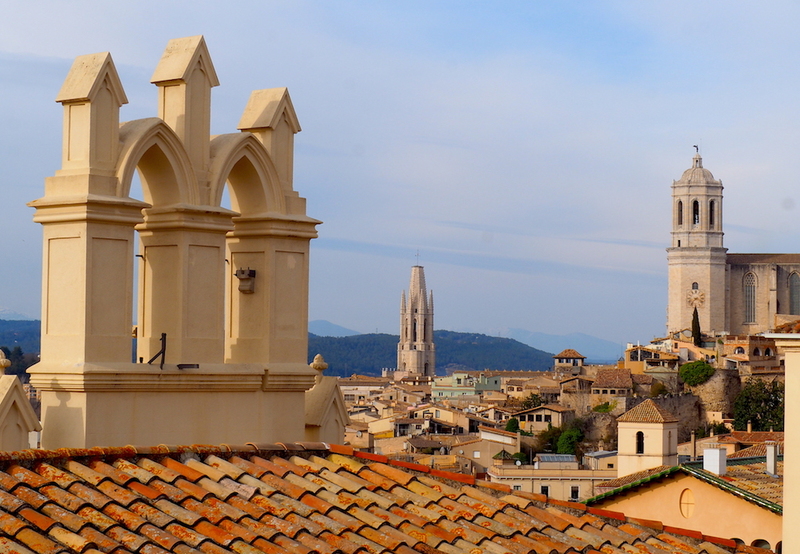 The dakness aside, in contrast the city’s cathedral and monuments are almost albino white, matching the distant Pyrenean mountains that provide the backdrop to the cityscape. With a minimalist style to their exteriors, simplicity shrouds this city. It is not out to wow you in the same way Seville does. It invites you to enter its inner hub and engage with its historical tale that spans back some one thousand years. 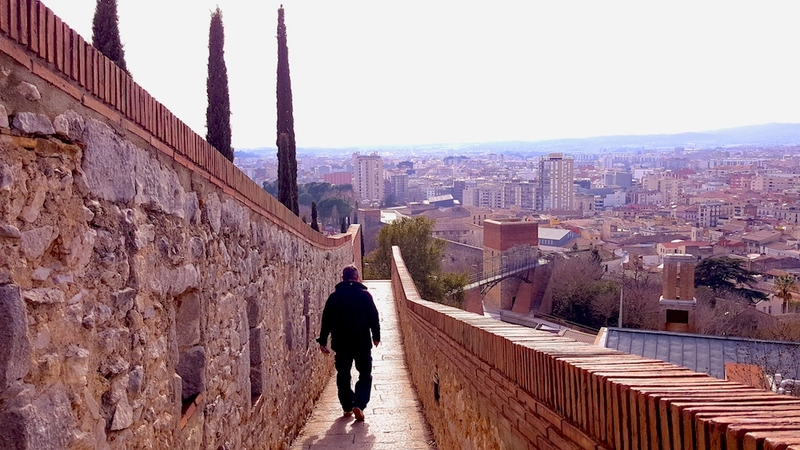 The main thing I learned from my guide book was to head for the Passeig de la Muralla – the city walls – as this offers a terrific bird’s eye view. And indeed what a great piece of advice. So often visiting cities we feel like ants as we try to get a full experience of the majestic buildings, somehow missing part of the jigsaw by being on the ground. Yet from above we were able to see the full picture emerge and the city’s modern day identity trying to converge with its historical father-figure. 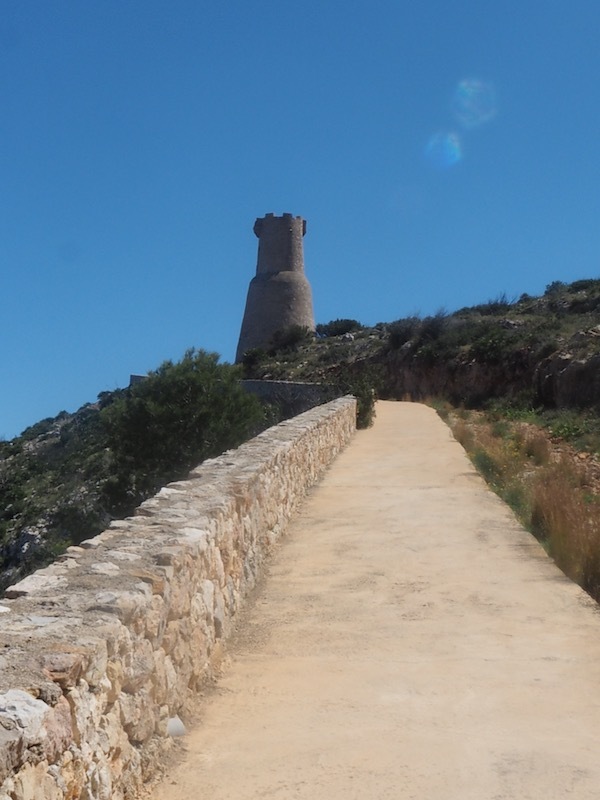 There are a number of entry points to this upper fortress passage. We started at the Cathedral end and worked our way south. En route to its maze-like entry, we passed the Banys Àrabs, the Romanesque Baths, which is very much intact and for €2 you can gain entry to this ancient masterpiece. A point to note, during the winter this is only open from 10-2 so be warned if a visit is on your list. Sadly it was shut for our city tour. Still, onwards we climbed up the seemingly never-ending stairs that lead to the walls, where towers positioned in battle readiness gave us a lofty view of the streets below. The walls have been lovingly and sensitively restored allowing us to walk in the footsteps of warriors who were set on defending their realm. What a terrific way to experience this compact old town. Back down at street level, we found the river again, where still few people graced the pavements. Yet a handful of hardy Catalonians brave the crisp winter’s grip that has taken Spain by surprise this year, sit outside for their early afternoon beer. Shops selling an enticing array of pastries more suited to a French boulangerie border the streets, reminding the visitor of its neighbour’s influence on its language and culture. Having thought we were finally getting to grips with Spanish vocabulary, arriving in Catalonia is another challenge altogether for our foreign tongue. So many variants remind you that the locals here are set on creating individuality and independence even if they have been ruled against it. The Jewish quarter was one of the largest communities in Catalonia back in 13th century, living harmonious alongside their Christian neighbours. Although after racial attacks, a massacre and persecution, the Jewish population either converted or were expelled from the country. Their community is called the Call, translated as the ghetto and museums today tell of their harrowing story whilst the street, with its intricate alleyways and cobbled lanes still hold their sombre secrets. It is a street with little light, which somehow seems befitting and symbolic of their story, with buildings leaning precariously close together as if in some sort of constructive solidarity. It felt odd to me as we left the solemnity of the street’s ghostly past that the faint and gentle sound of a street musician should break the historical spell, as he played to his unappreciative audience on the steps of the Cathedral. Except for me who felt compelled to offer him rapturous applause for his musical talent. The Cathedral like so many, regales in its architectural glory with steep steps climbing to its doorway, as if forcing you to make the commitment to reach its religious sanctuary. Sitting strangely alongside its Jewish neighbours, this city paradoxically shows how two different factions of the community can coexist. 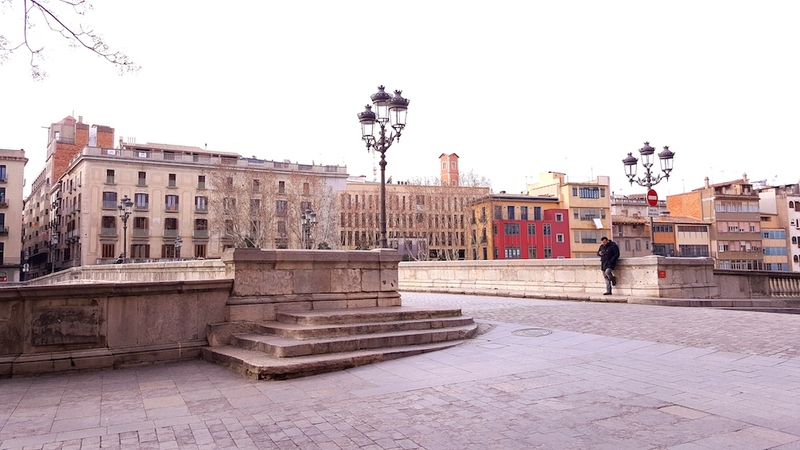 One final pièce de resistance, if my French isn’t completely out of place in a Spanish write up, is La Plaça de Independence, just on the other side of the river. A huge square with café-lined archways that set the scene for a small yet power symbol of the fight for independence back in the early 17th century. Whilst today dogs walk, cycles create wheel-track patterns in the sand and Instagramers look for the ultimate pose, there is a strange message carried through the ages about fighting for your right for liberation. A fight that still is very much alive, if not yet a battle won. And so this university city with its throng of youngsters, musical festivals and weekly markets does have plenty to offer for a day’s visit. Modern one side and ancient the other, an eclectic mix that offers the visitor an day of intrigue, good quality walking and an insight to city holding onto its historical identity. So how would we sum up Girona? 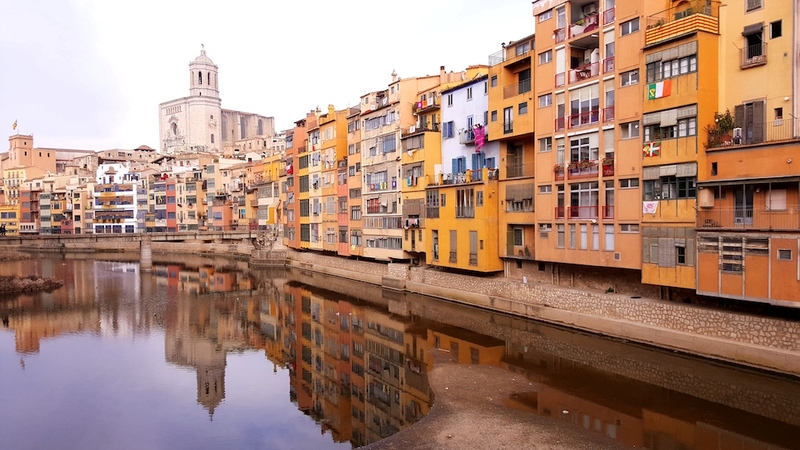 Whilst it may not sparkle like its Spanish siblings, Girona has character and with its compact streets and bird’s-eye fortress promenade, it offers up a unique perspective of a yester-year that gently asks to be remembered. We are glad we came and we would definitely would recommend a visit here, although it did leave us sadly wanting. Whether it was the austere feel, the dark streets or the quietness, there was something missing for us. That said, come make up your own mind – it must be experienced even if only for its city walls. Come in spring or autumn as there will be more life to the place and it will certainly feel warmer. Start your visit in the morning when you will experience the smell of Girona from the plentiful Boulangeries. 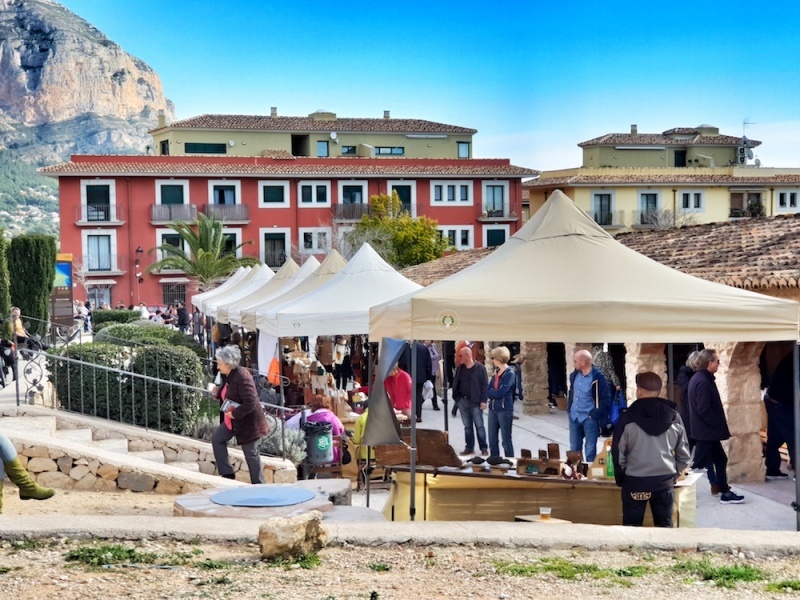 Do tie your visit into a Saturday as the market in Devesa Park is one of the largest I have ever seen with hundred of vegetable and clothes stalls. 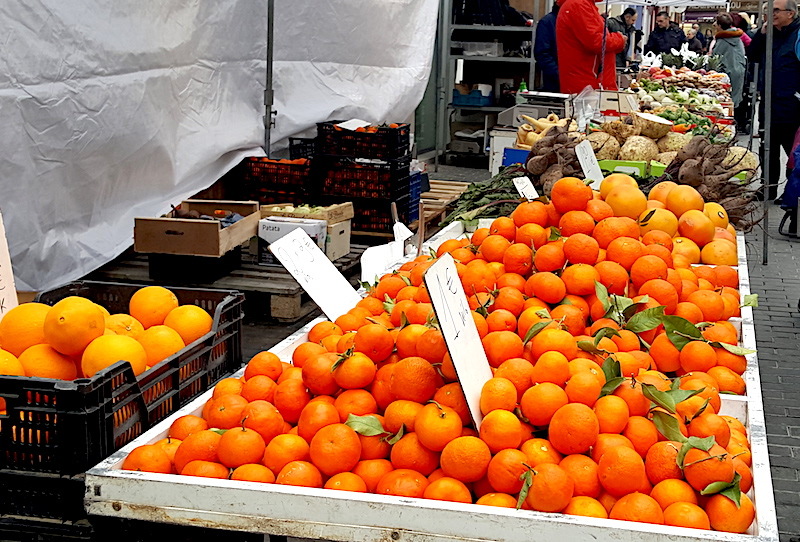 Markets are always a great way to experience the ‘real’ city and its locals. And Girona’s population is incredibly diverse. Do the City Wall walk first so that you can gain a real perspective of the place. 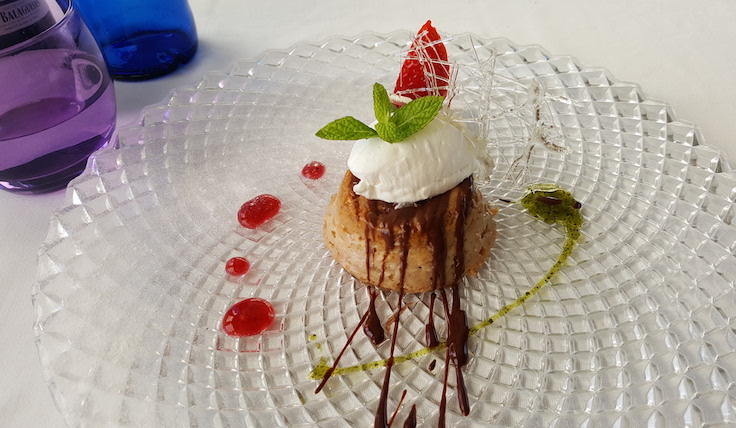 Experience at least one of the many restaurants as Girona is famed for its classical Catalonian fare. Visit museums before 2pm as they tend to close for siesta. Avoid using the ATMs in town – every one I tried wanted to charge me commission. So come prepared with plenty of cash. 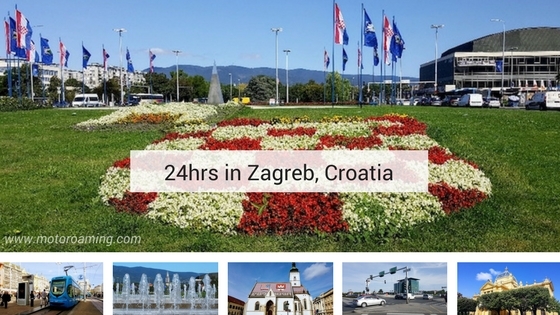 Hotels are just on the outer edges of the old town and are within walking distance. 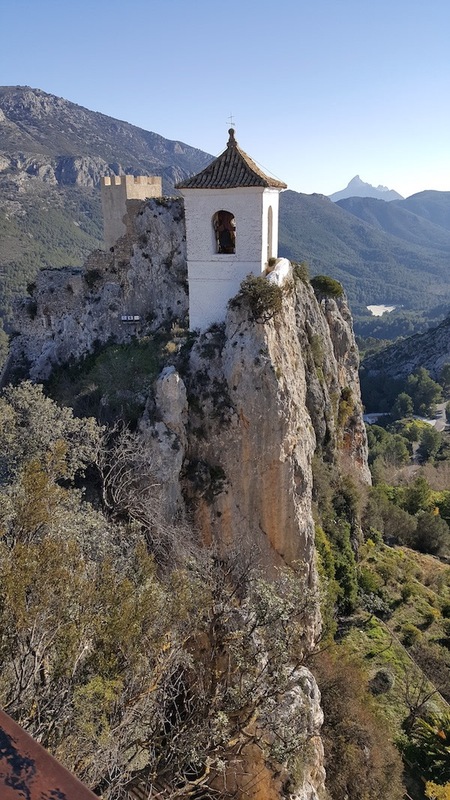 So you know that last week saw Karen walk her talk – live life beyond fear by doing the El Caminito del Rey walk in Andalucia, Spain. She’s given us some footage, which we’ve put to a vid. We hope you like it – it gives a bird’s eye view of this exhilarating walk.